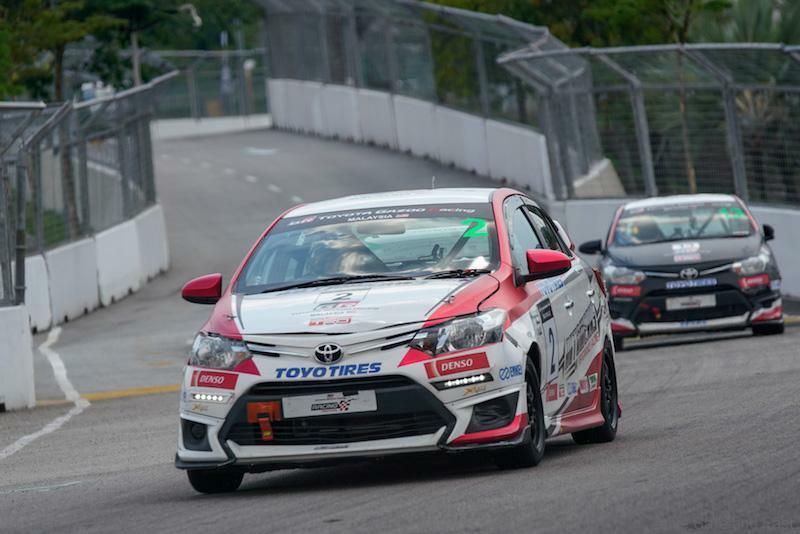 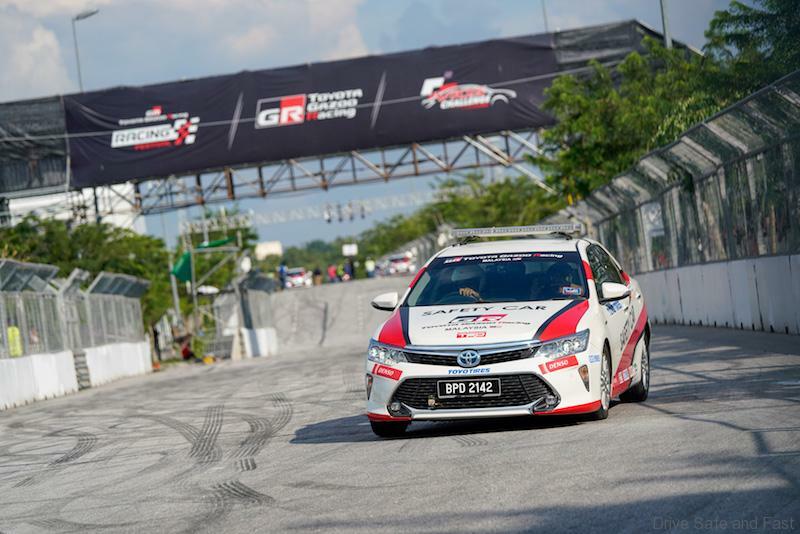 The competition, which is part of Round 2 of the TOYOTA GAZOO RACING Festival, was fierce in all three-categories with drivers taking on the newly-resurfaced 1.99km street circuit which featured 17 extremely challenging corners with varying track conditions consisting of both uphill and downhill stretches. 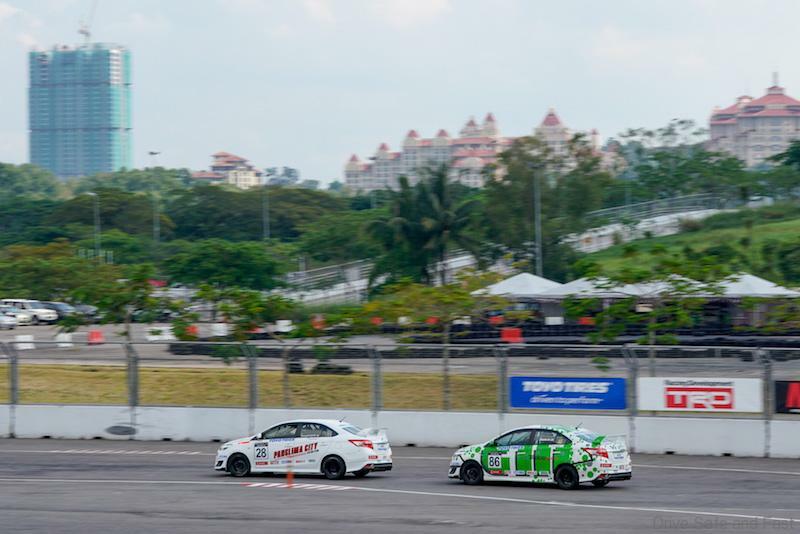 Television host and presenter Nabil Ahmad was in commanding form in race 1 of the Promotional class when he drove to his first race win of the season, finishing the 18-lap race almost two seconds ahead of actress Diana Danielle followed by singer Aiman Tino in third place. 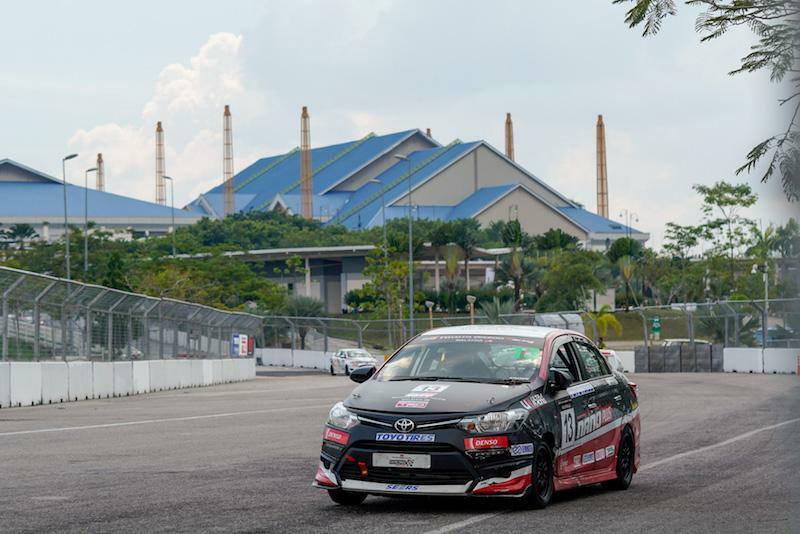 Nabil had qualified on pole position after setting a blistering time of 1 min:29.278 and capitalized on his front row start to lead into the first corner. 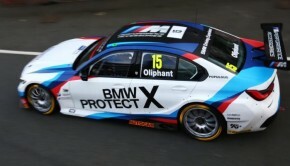 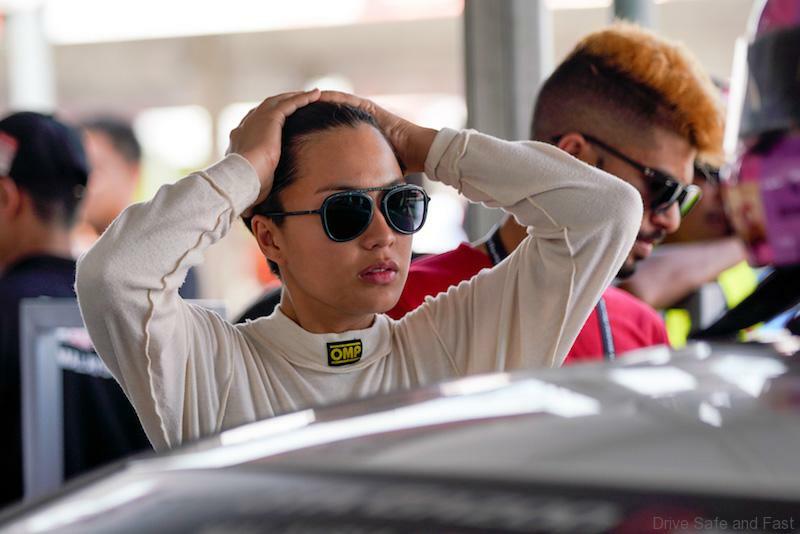 Diana meanwhile, was in top form all throughout the practice session on Friday and qualified second fastest. 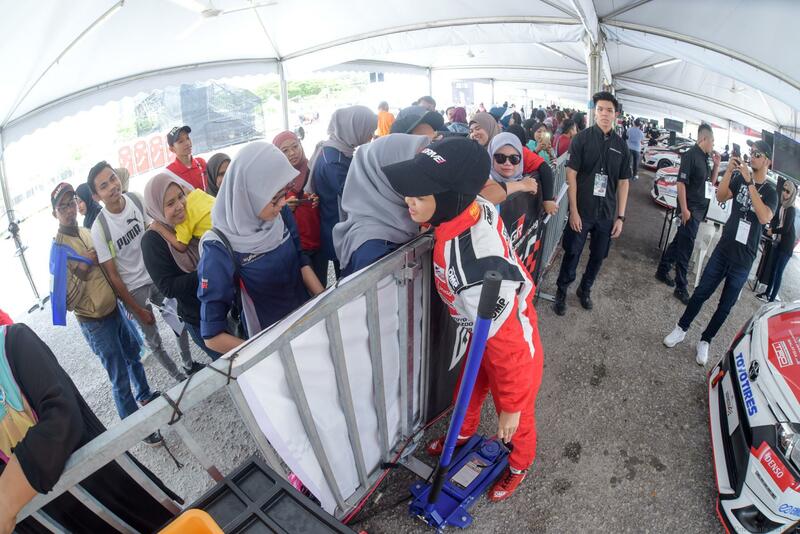 Aiman was however, the biggest surprise of the day when he muscled his way to overtake four cars at the start to climb from seventh on the grid to third place by the time he reached the first corner. 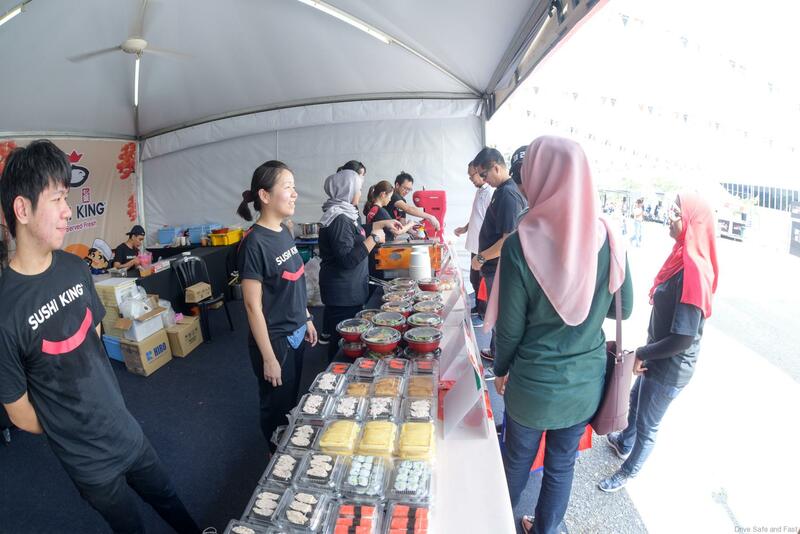 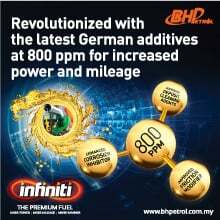 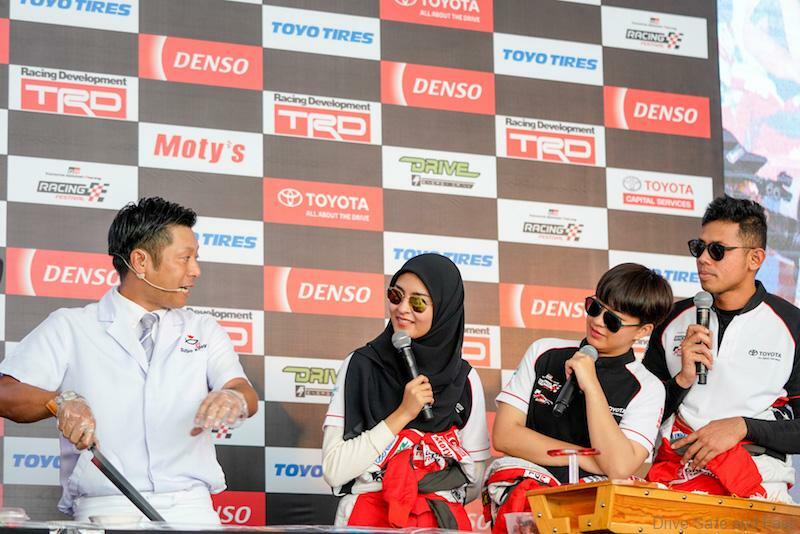 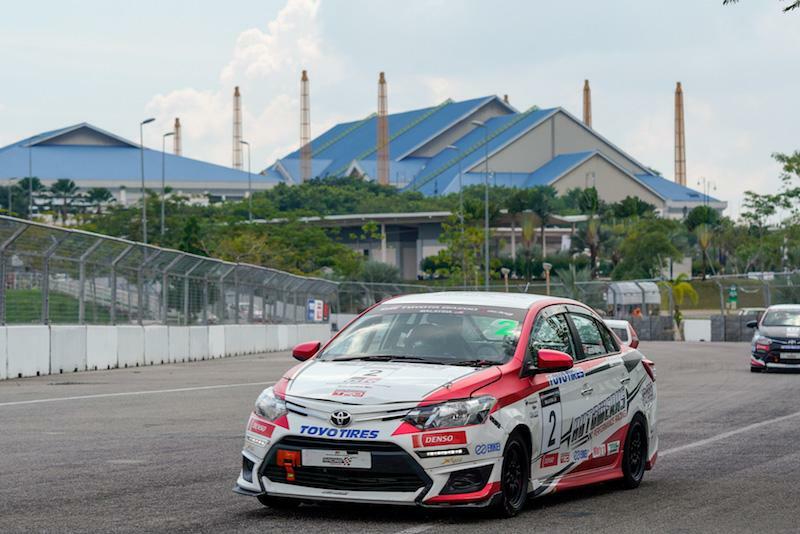 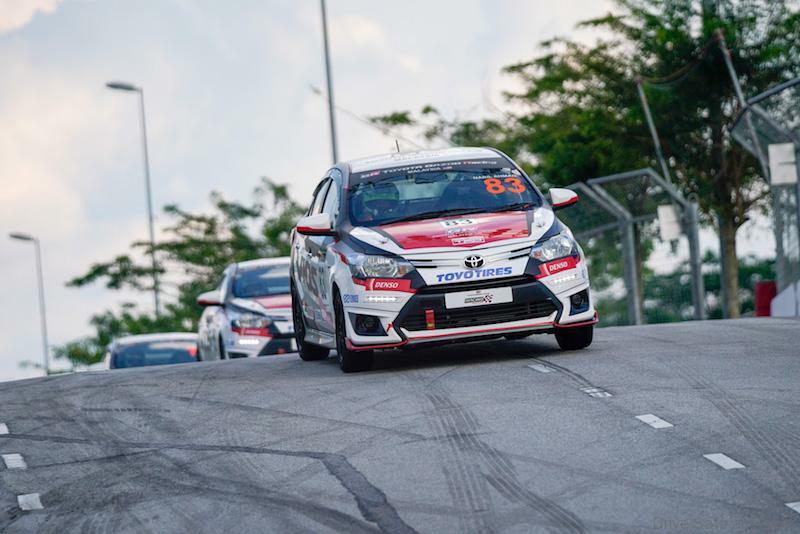 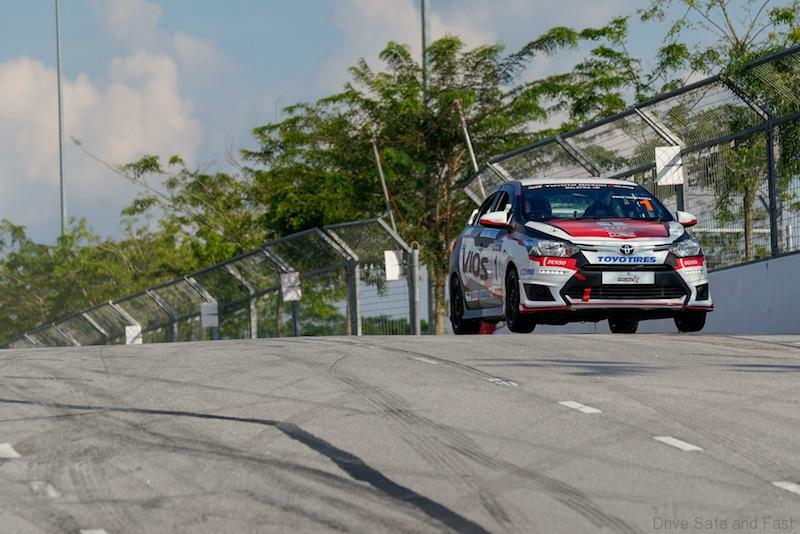 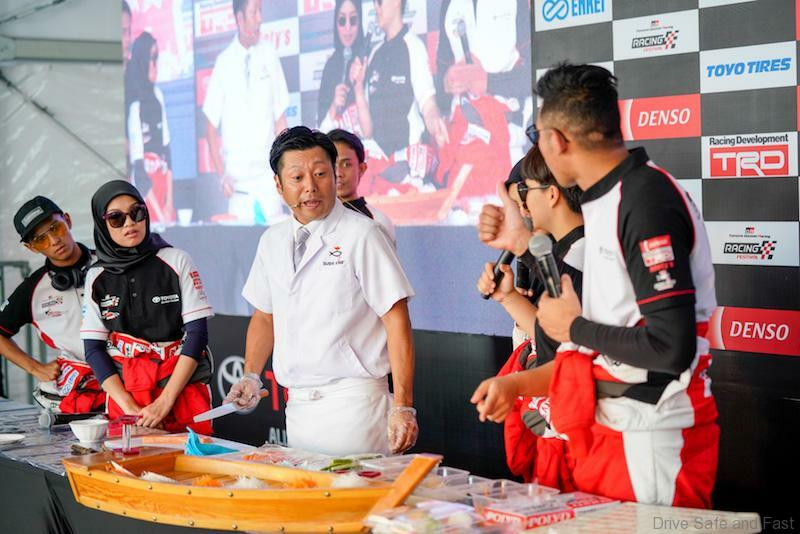 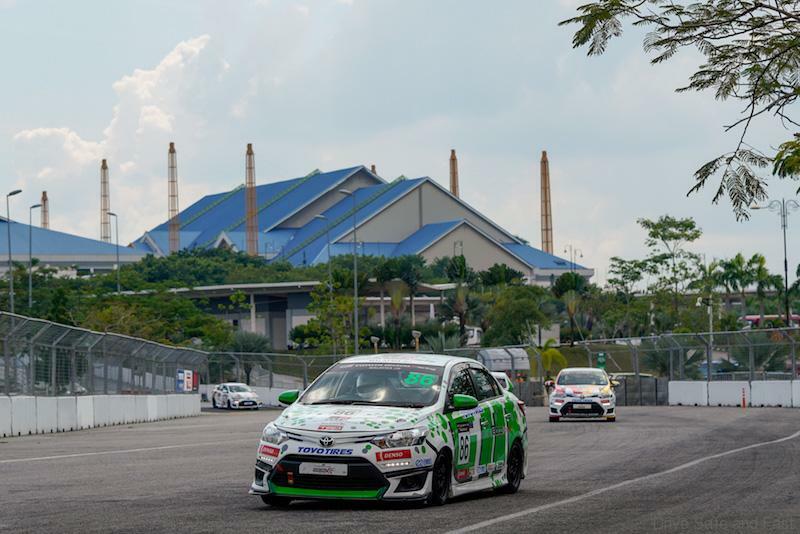 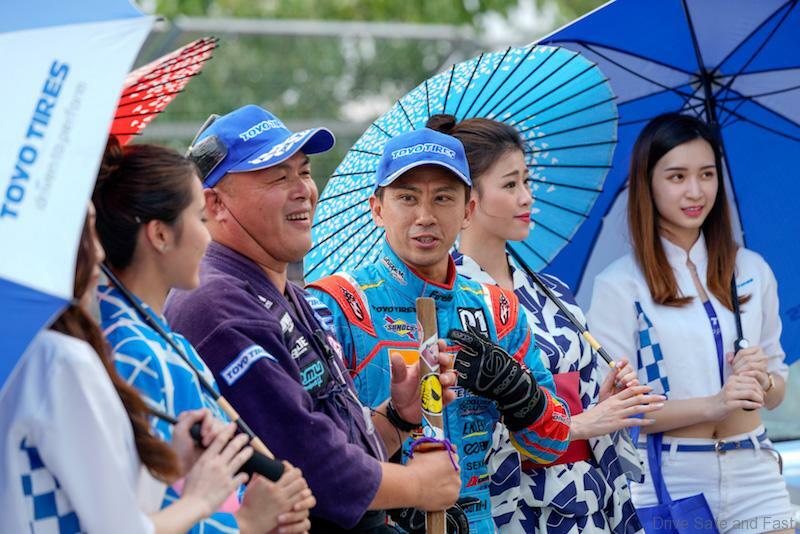 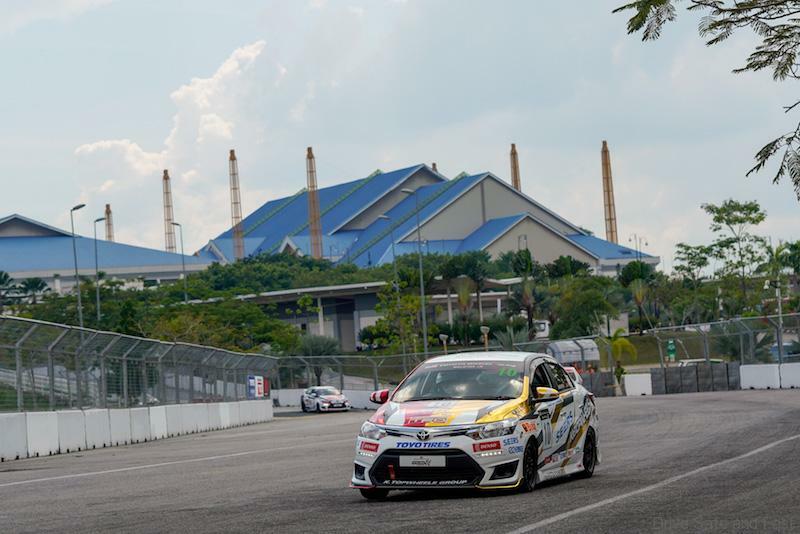 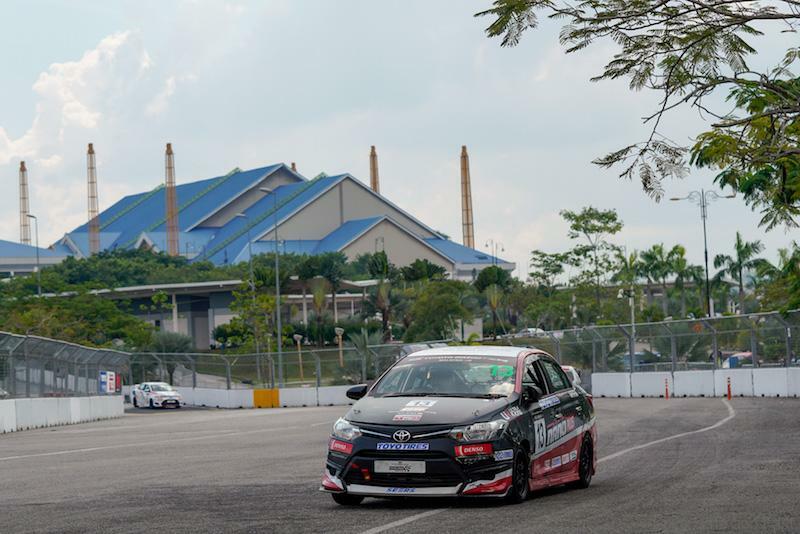 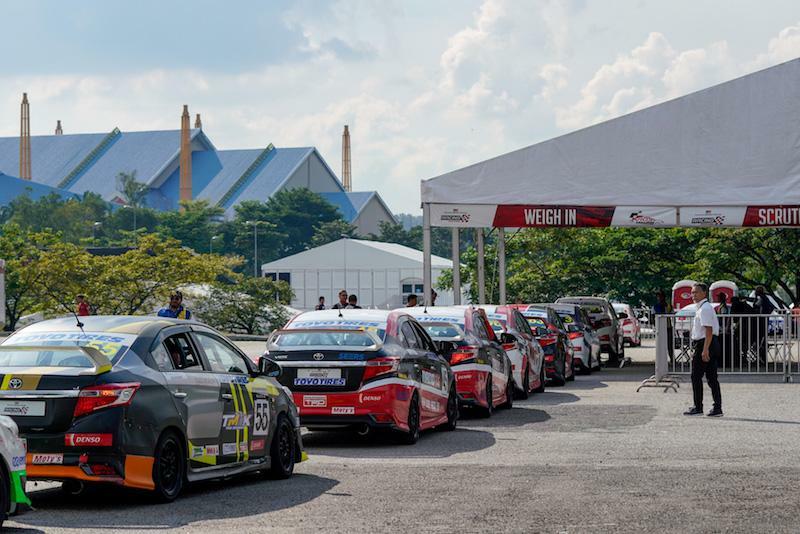 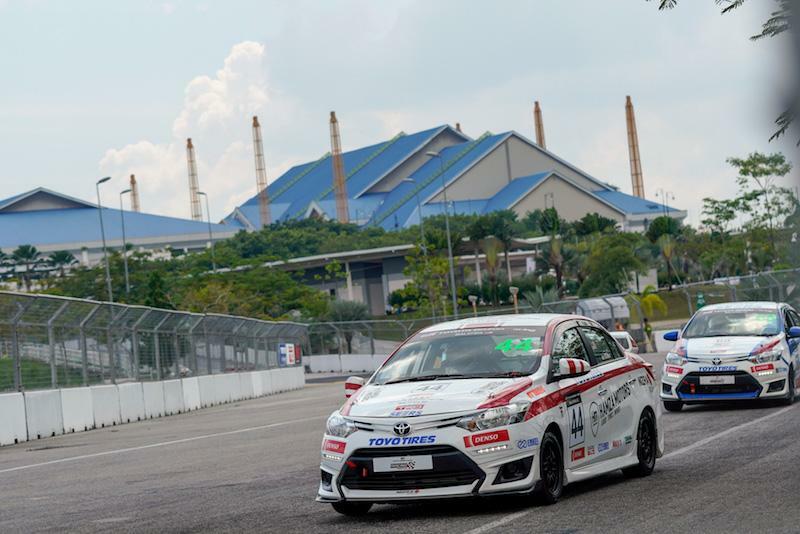 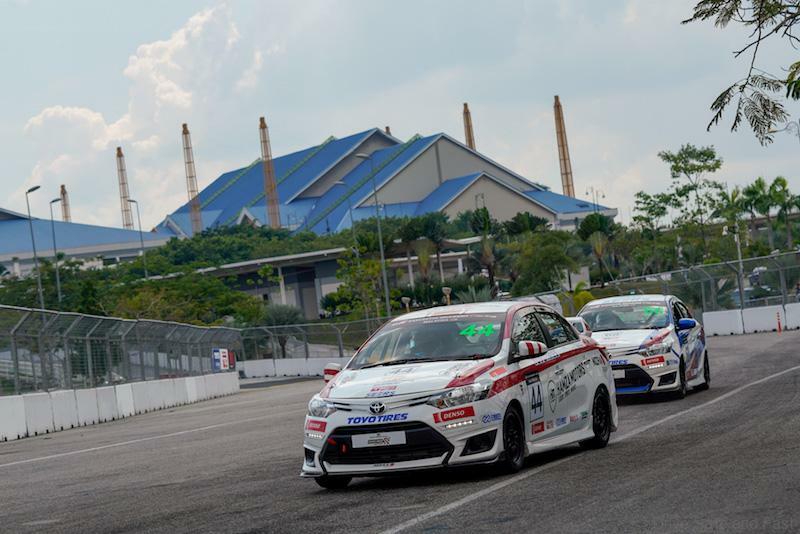 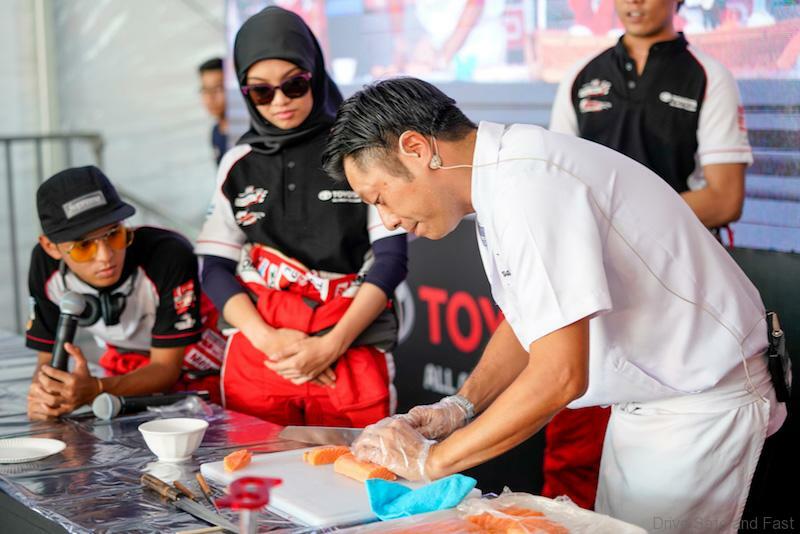 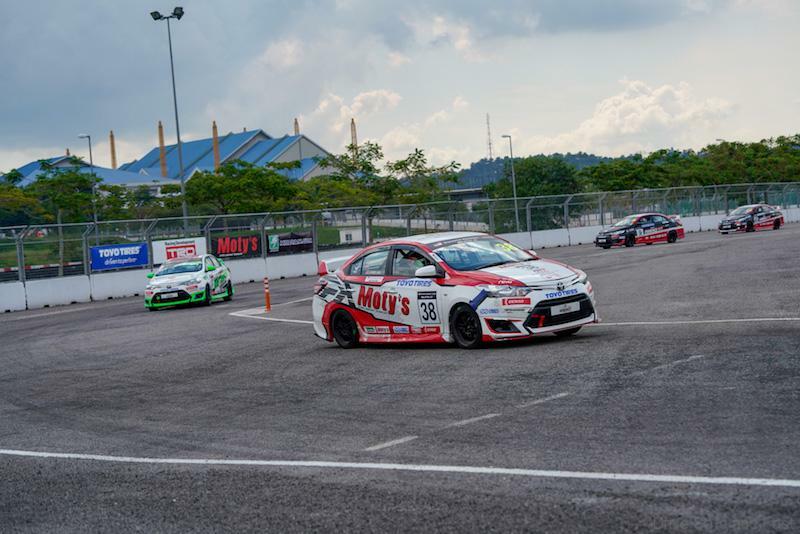 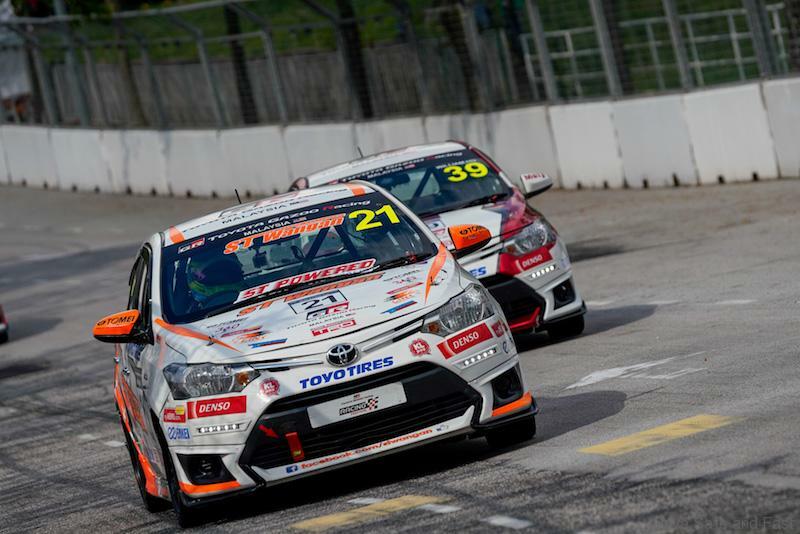 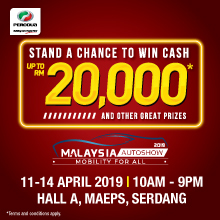 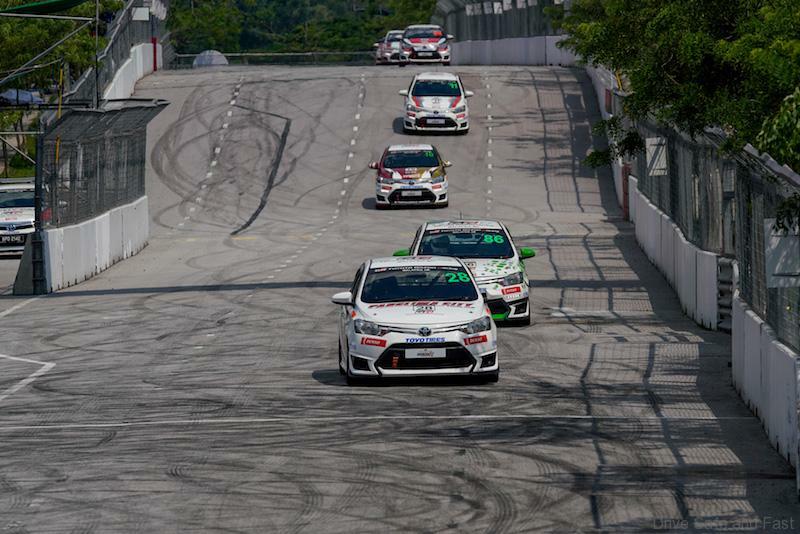 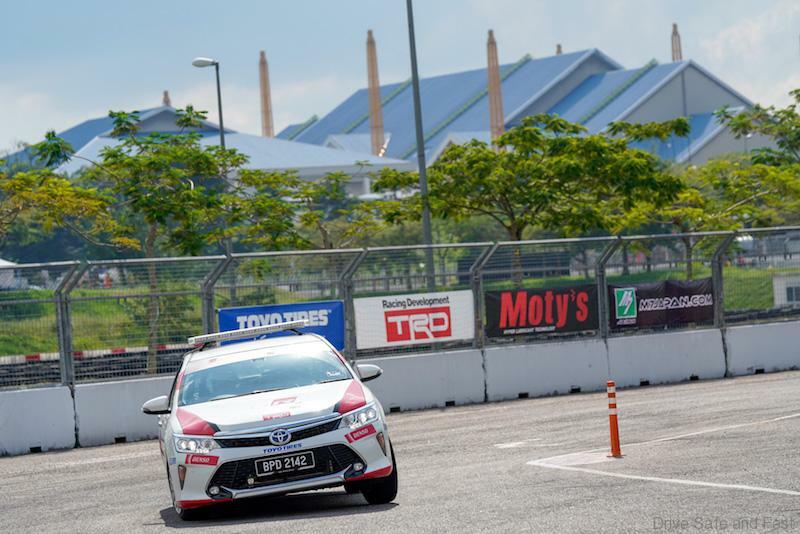 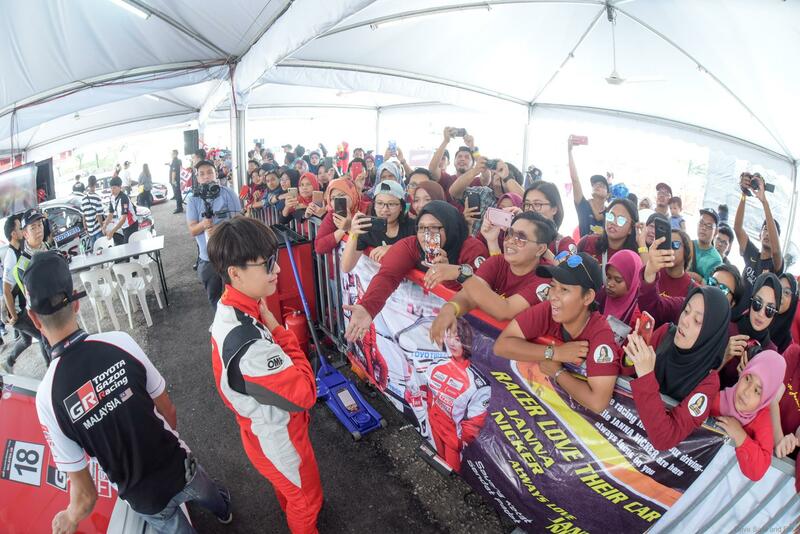 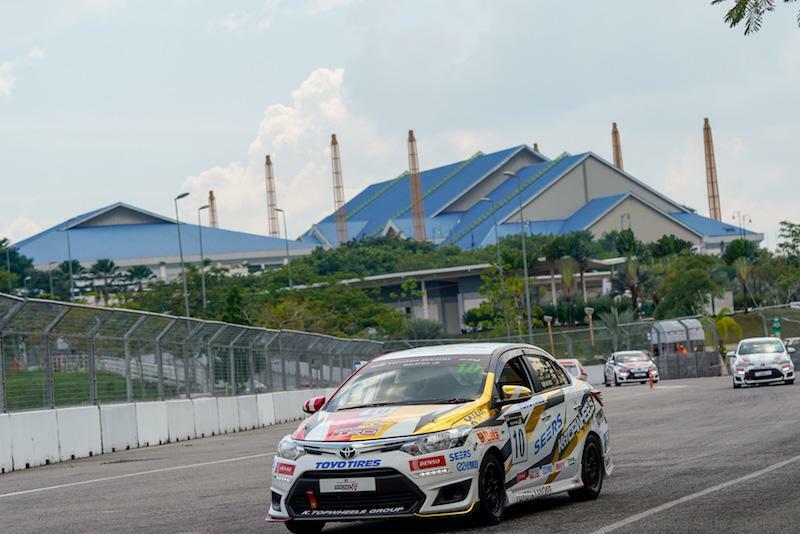 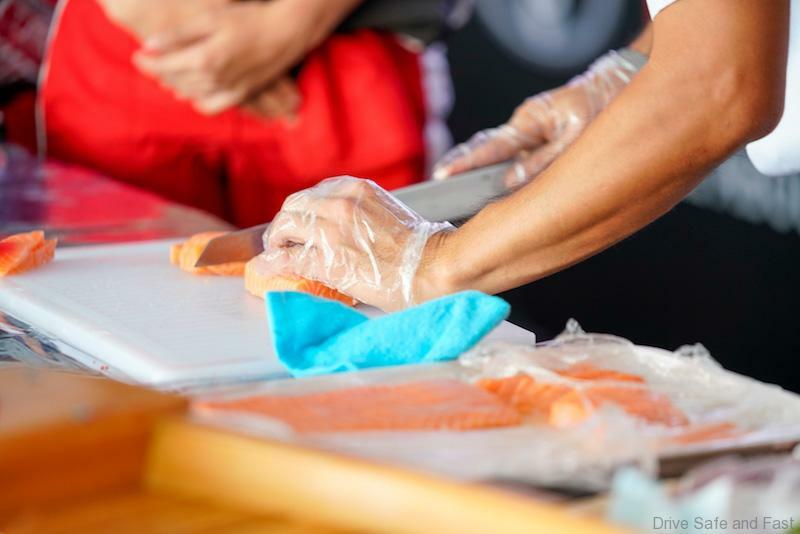 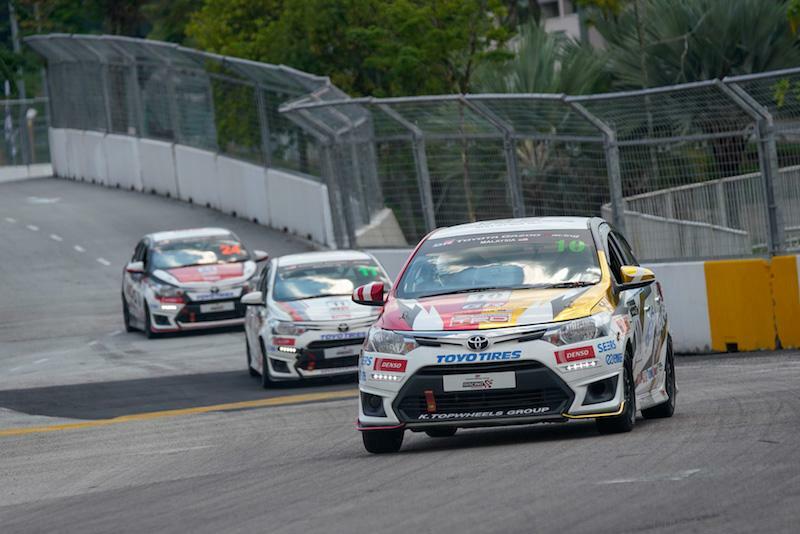 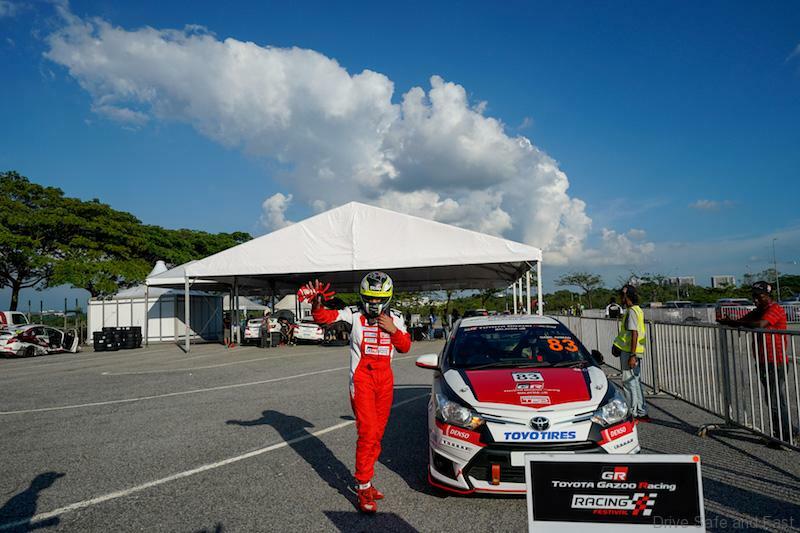 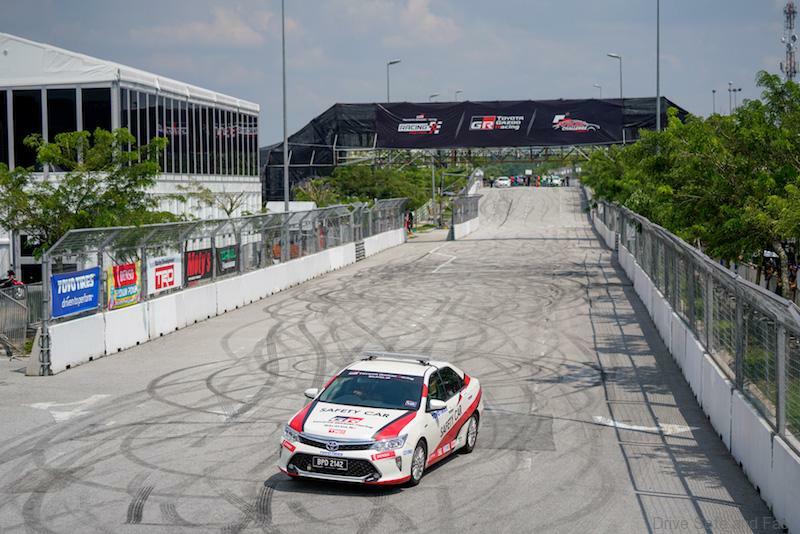 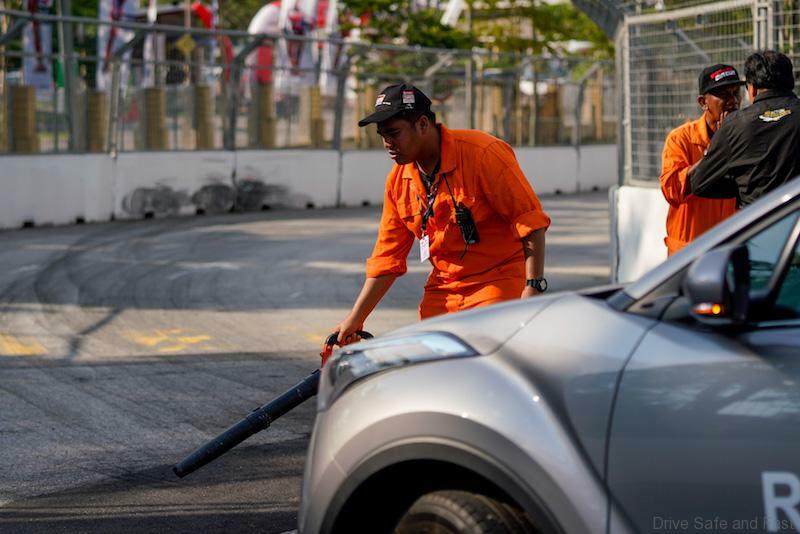 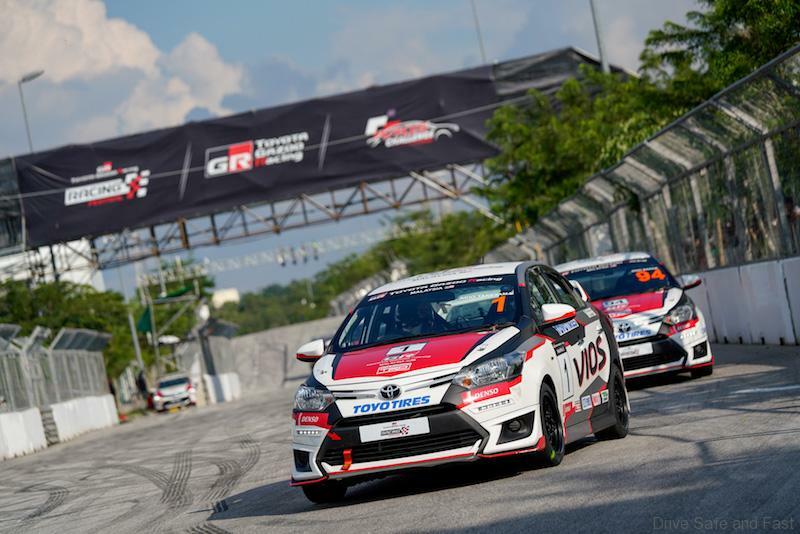 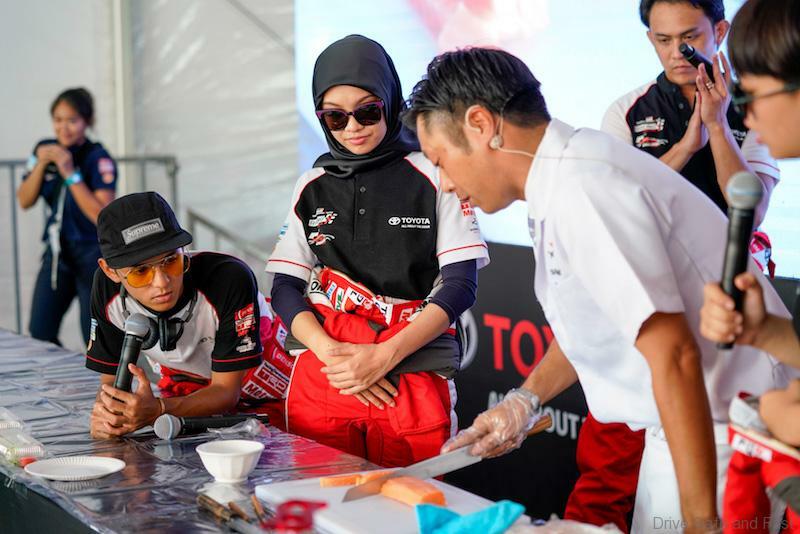 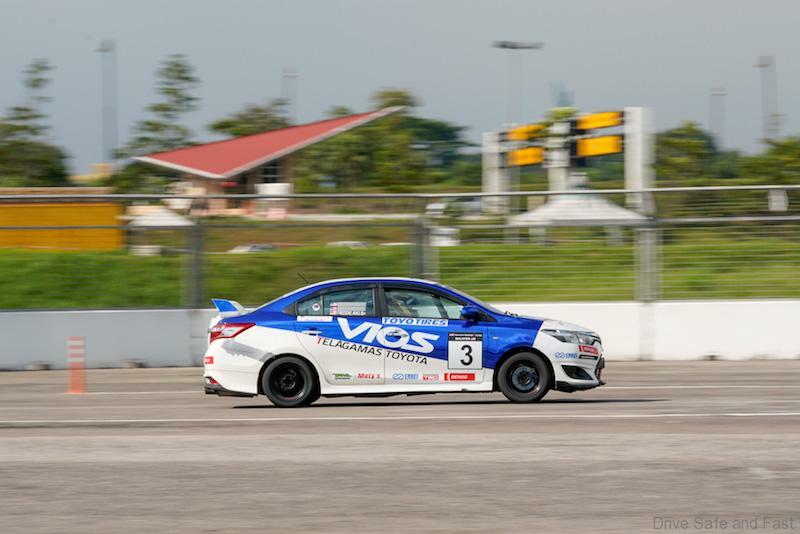 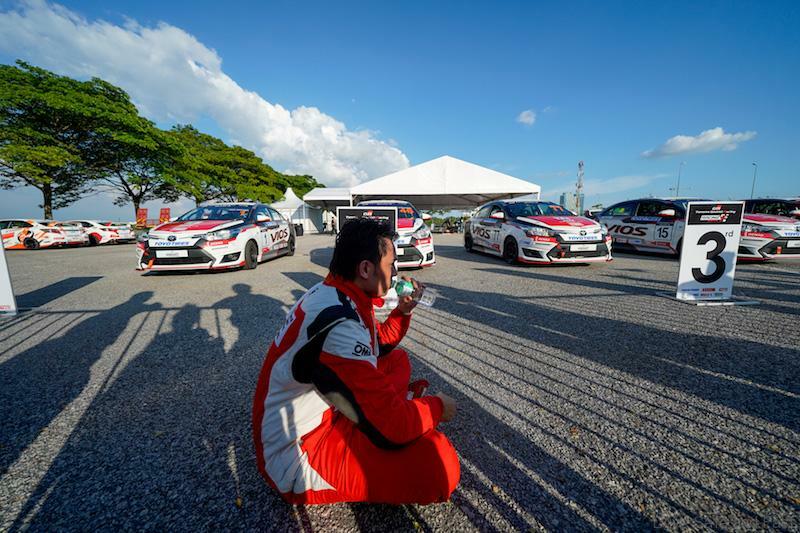 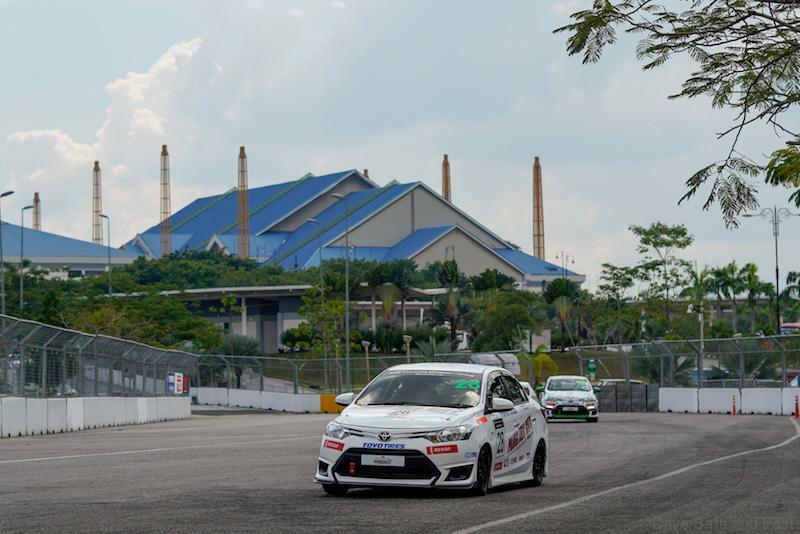 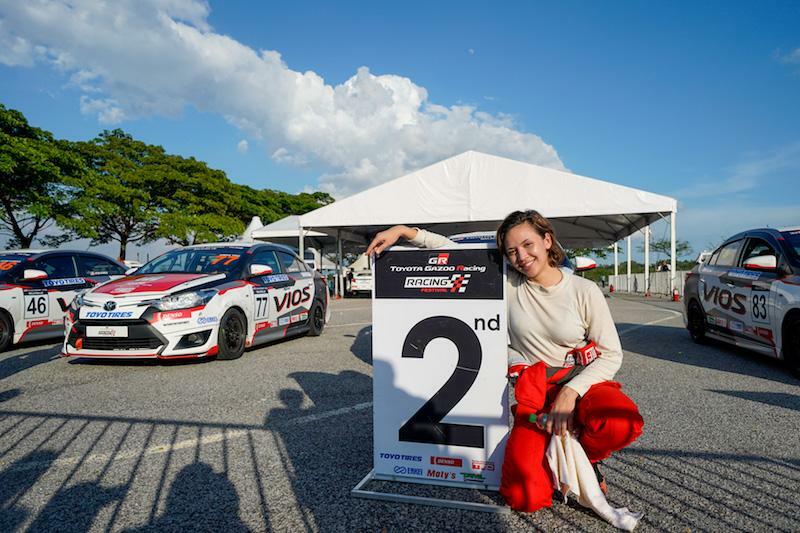 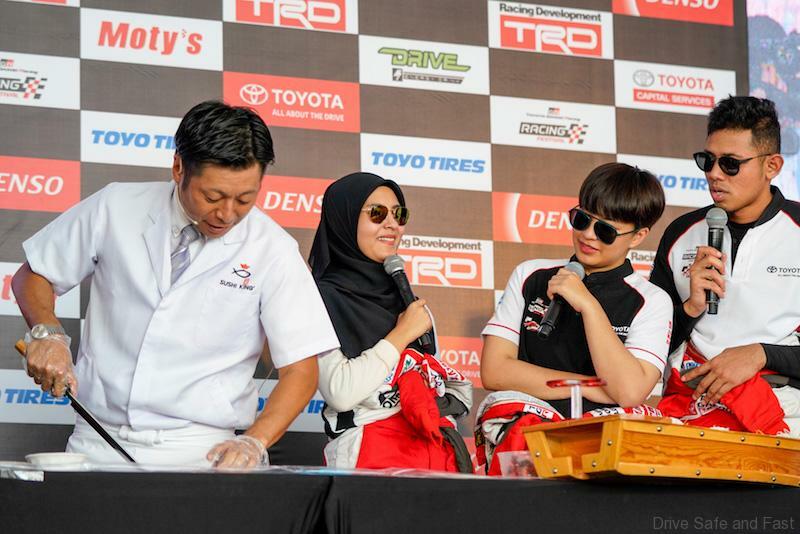 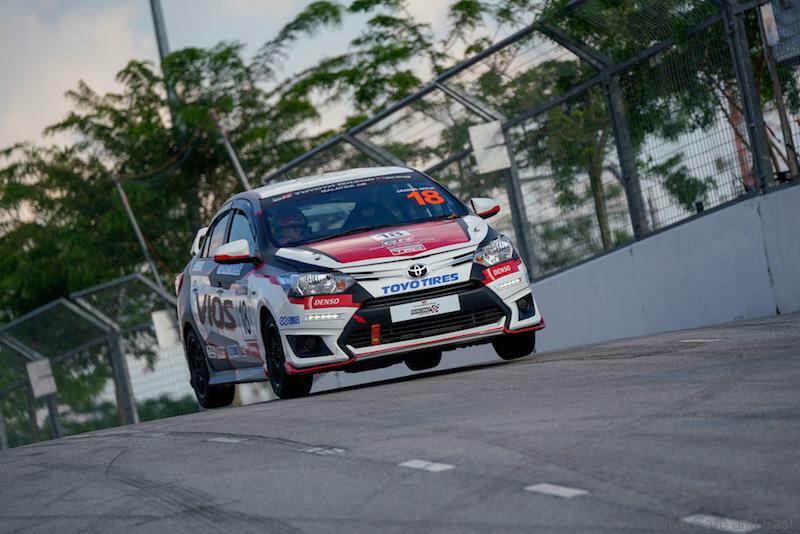 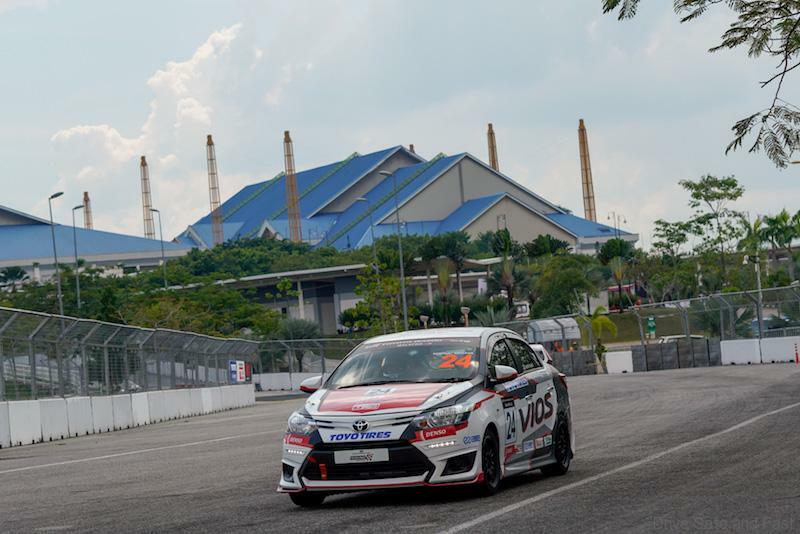 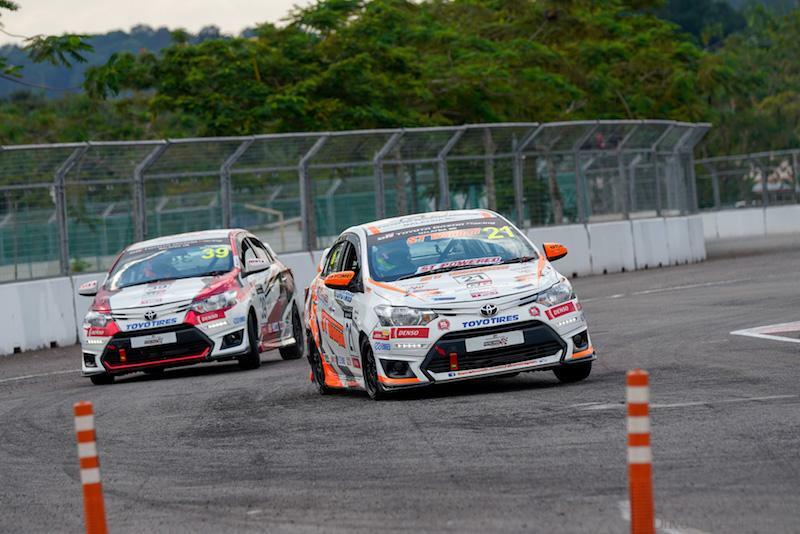 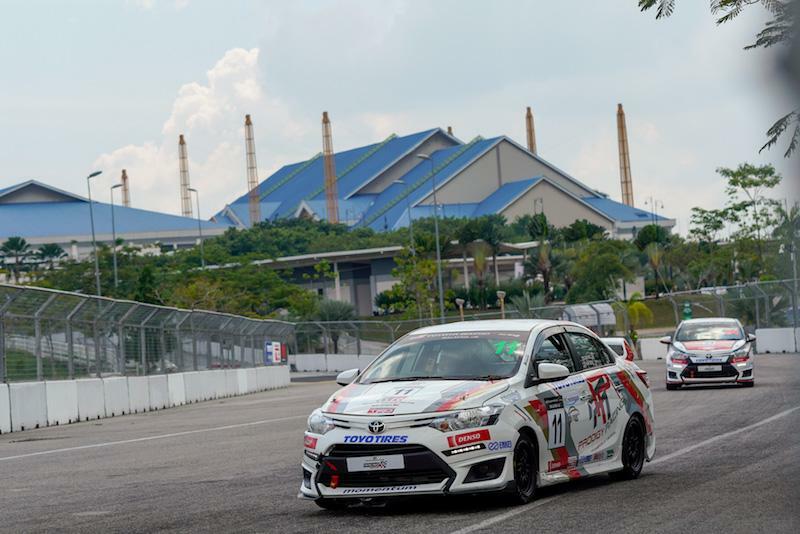 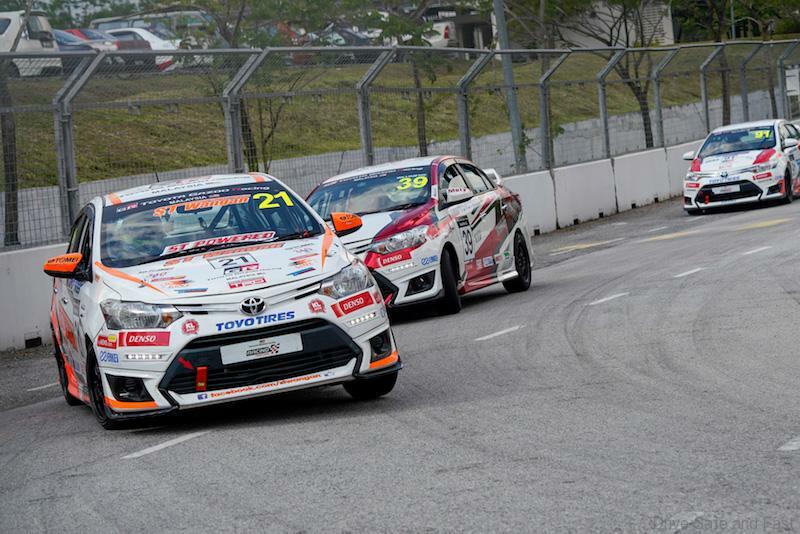 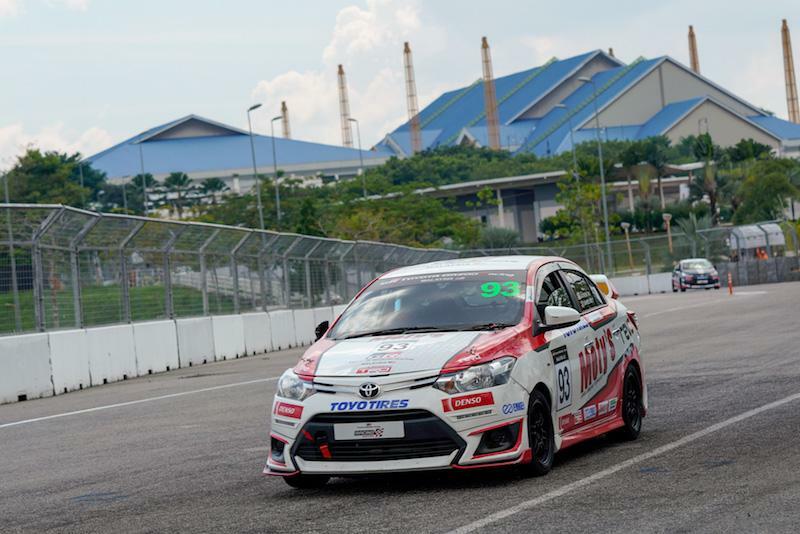 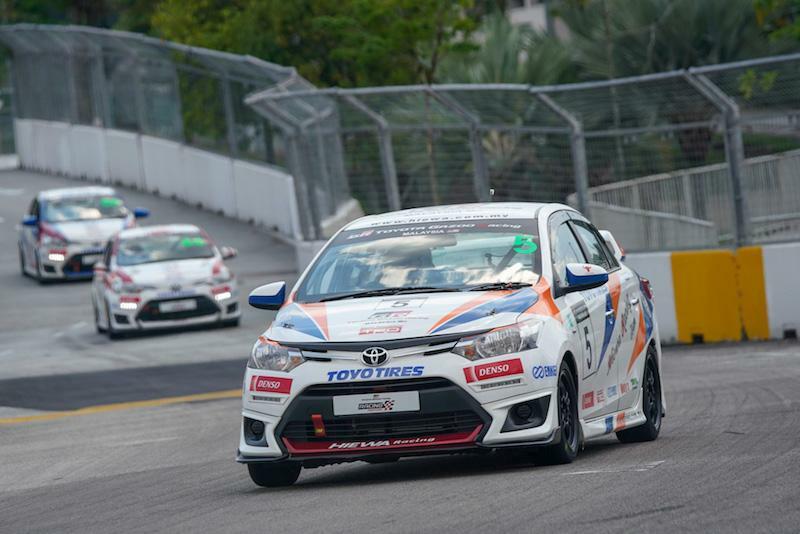 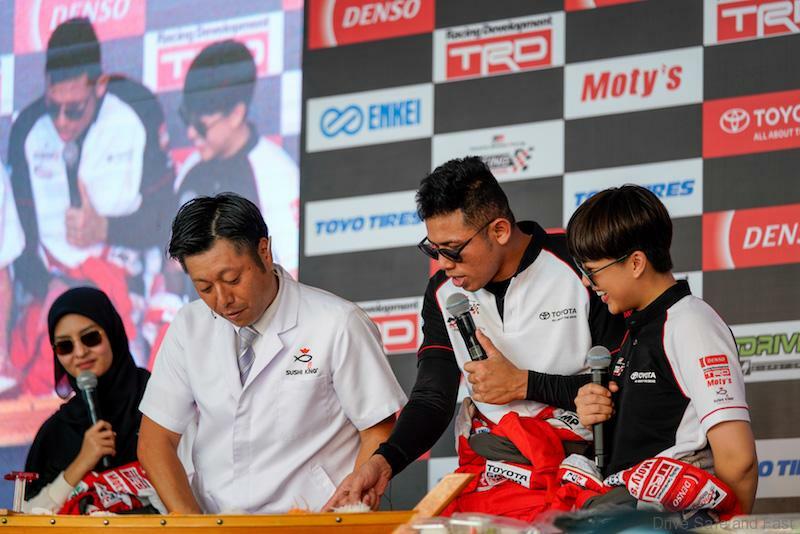 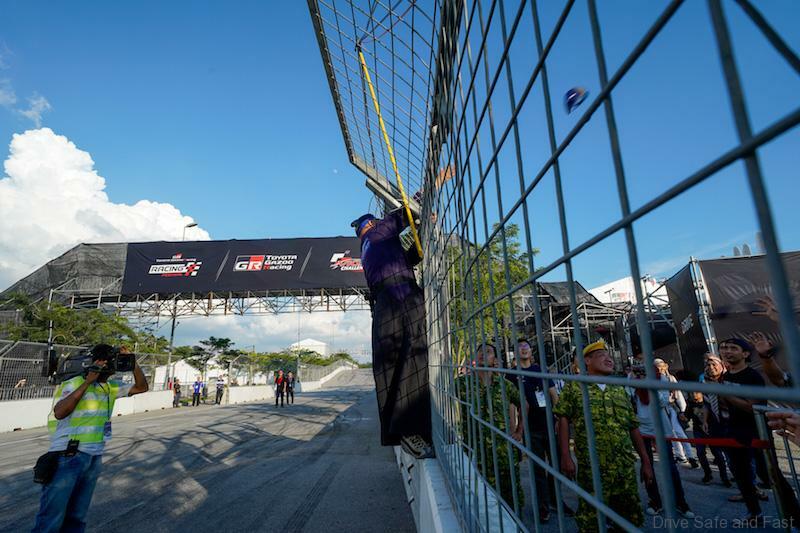 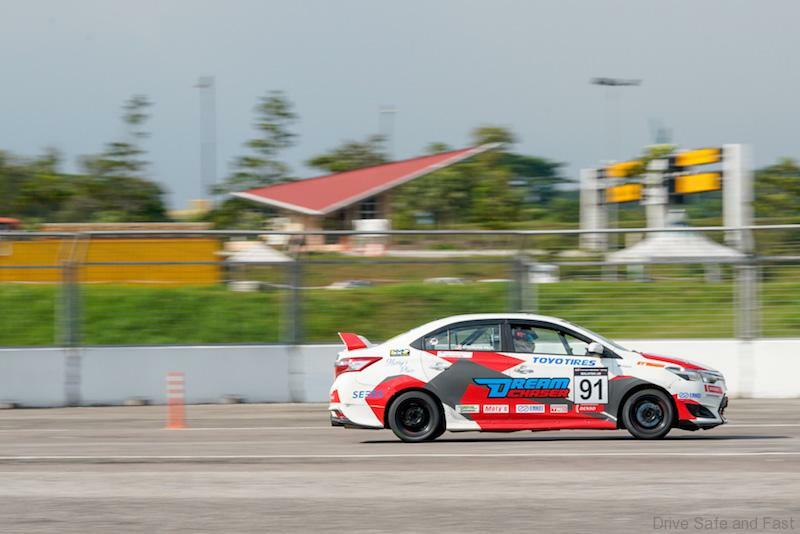 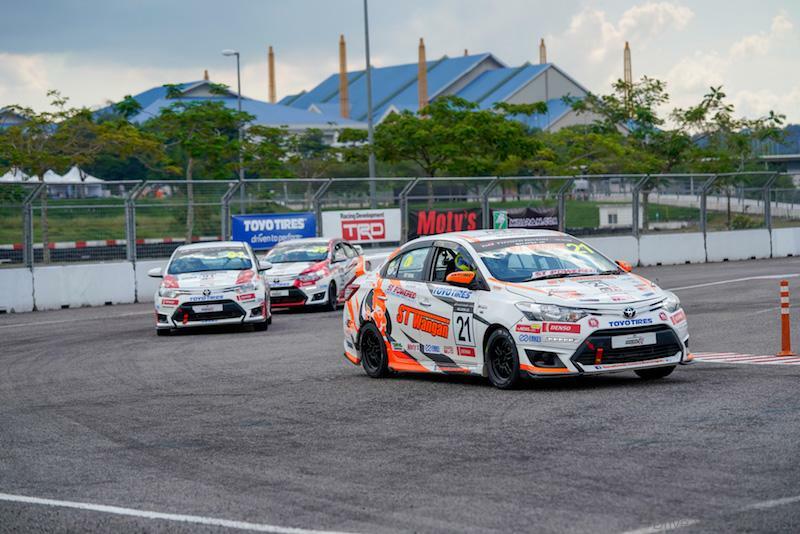 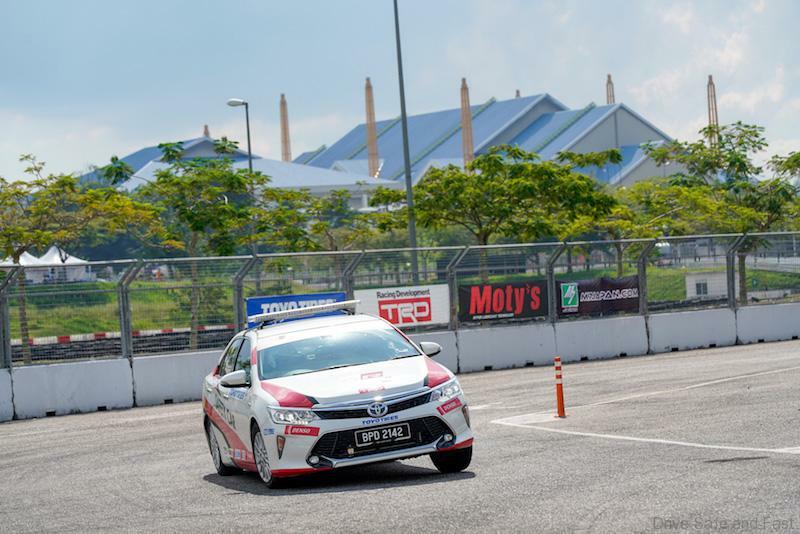 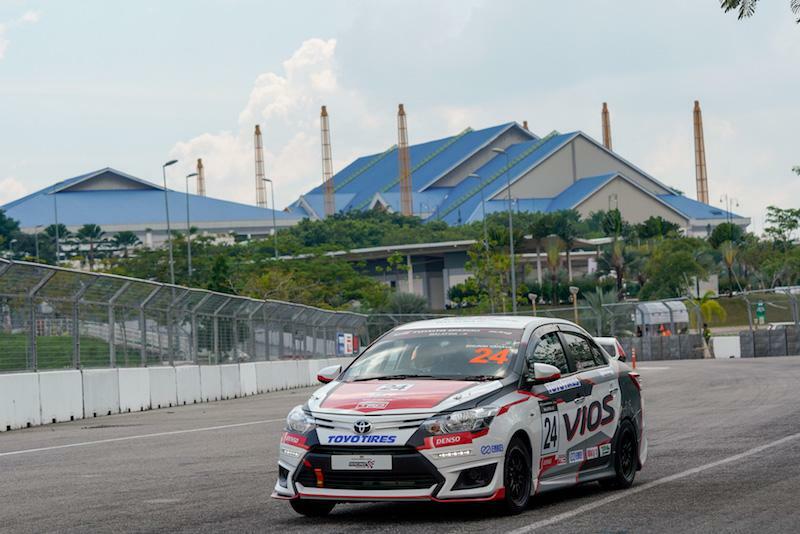 Completing the top five were Akim Ahmad and UMW Toyota Motor Sdn Bhd Deputy Chairman Akio Takeyama, while Khai Bahar, Janna Nick and Nabila Razali crossed the line in sixth, seventh and eighth position respectively. 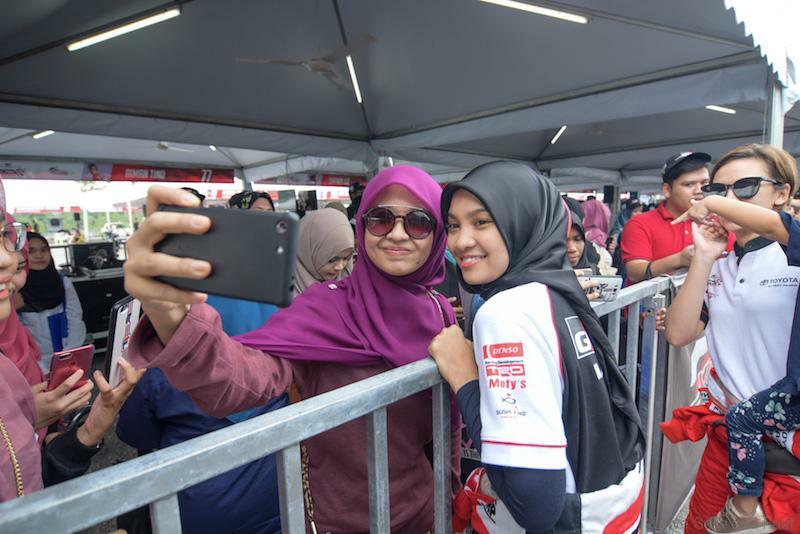 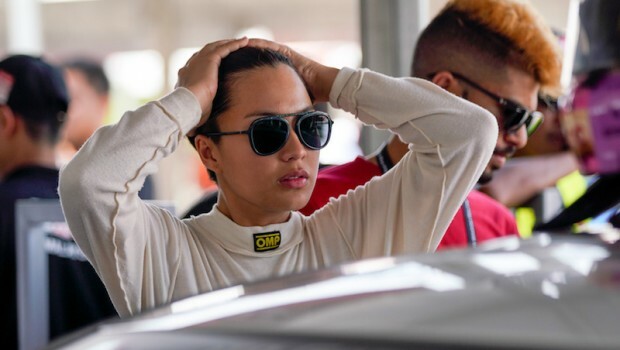 Singer and recently-crowned Anugerah Bintang Popular winner Wany Hasrita retired from the race in lap 7 after being pushed into the wall. 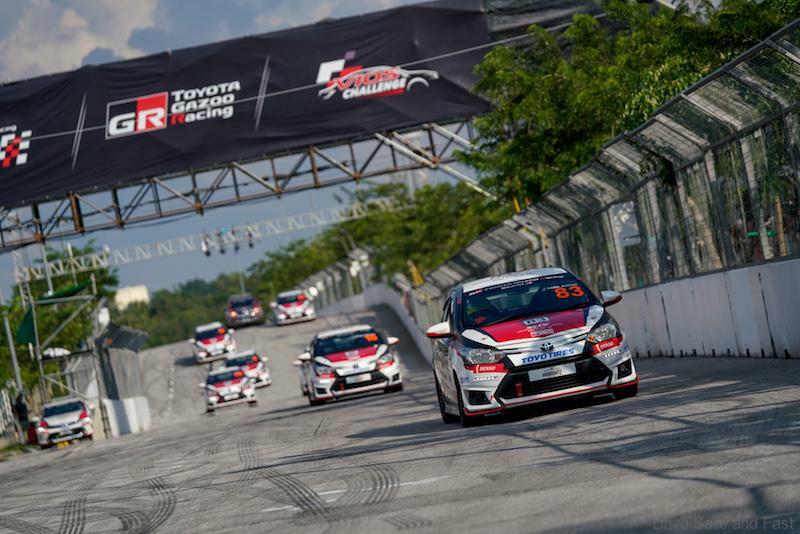 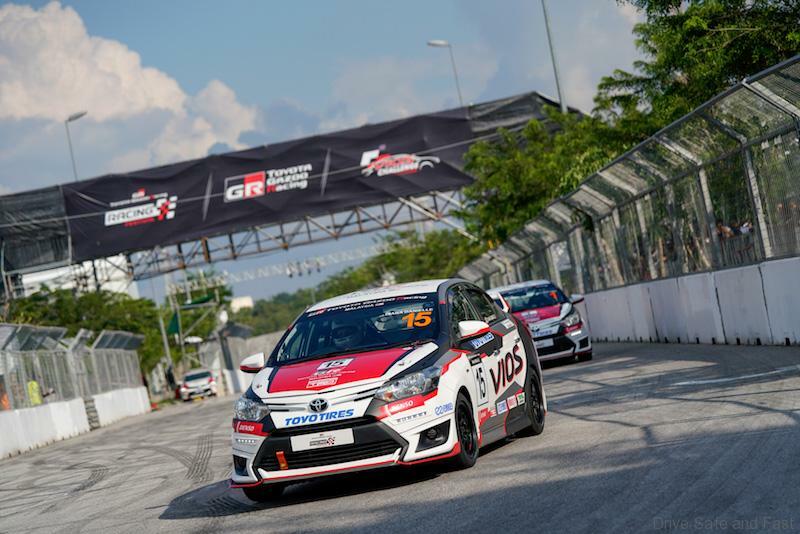 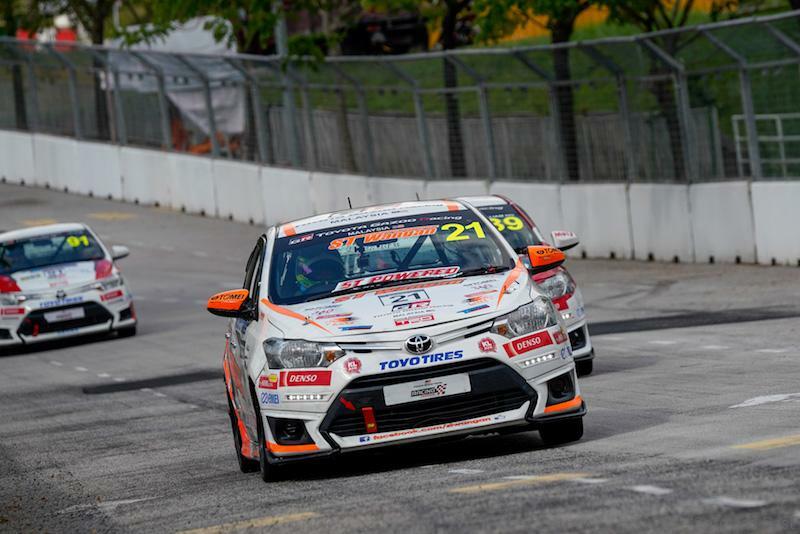 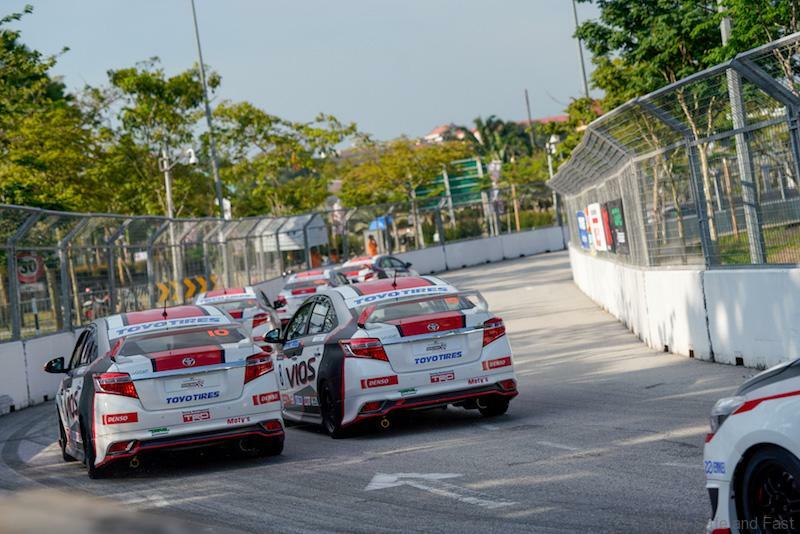 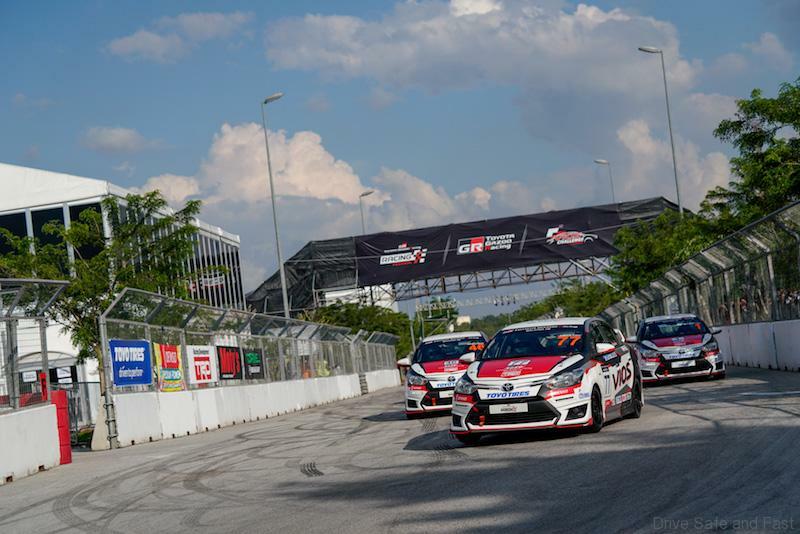 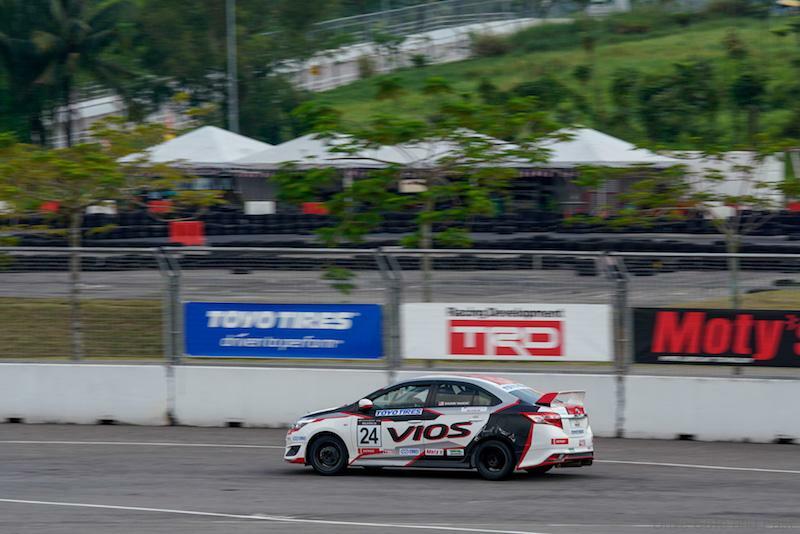 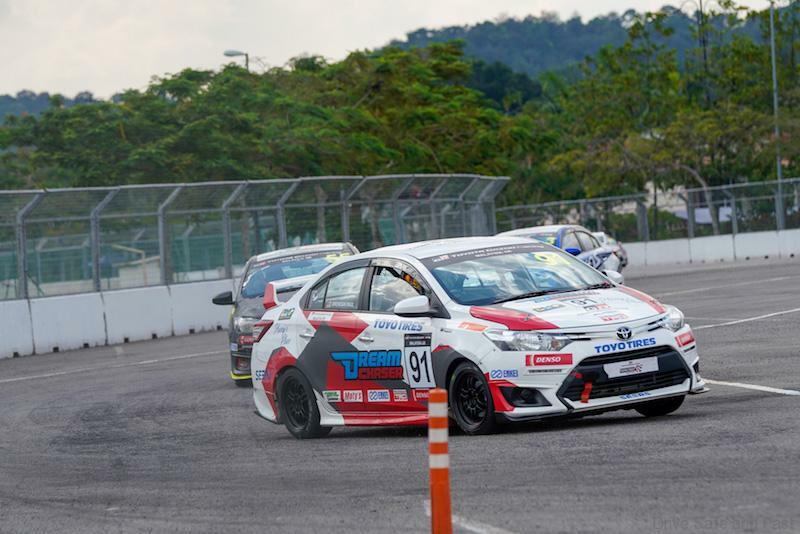 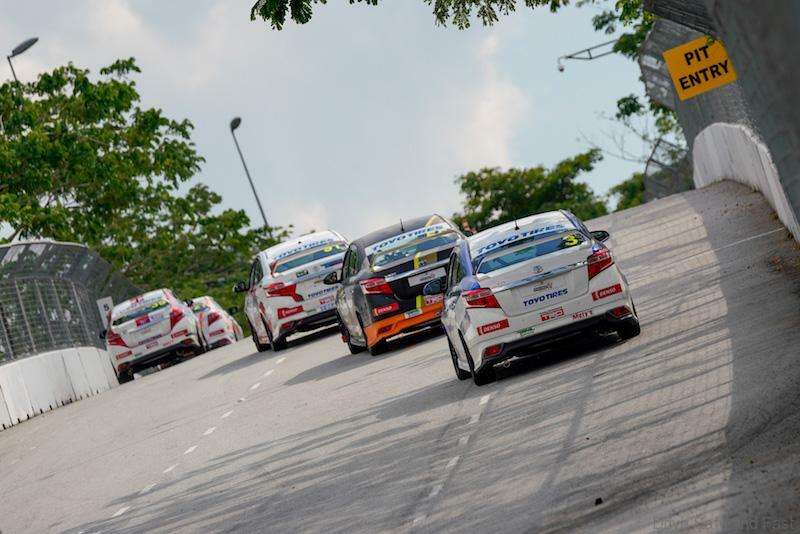 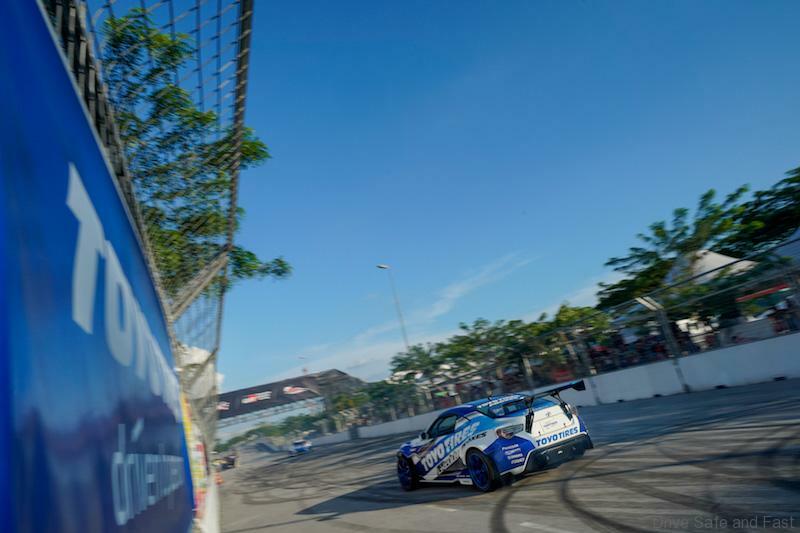 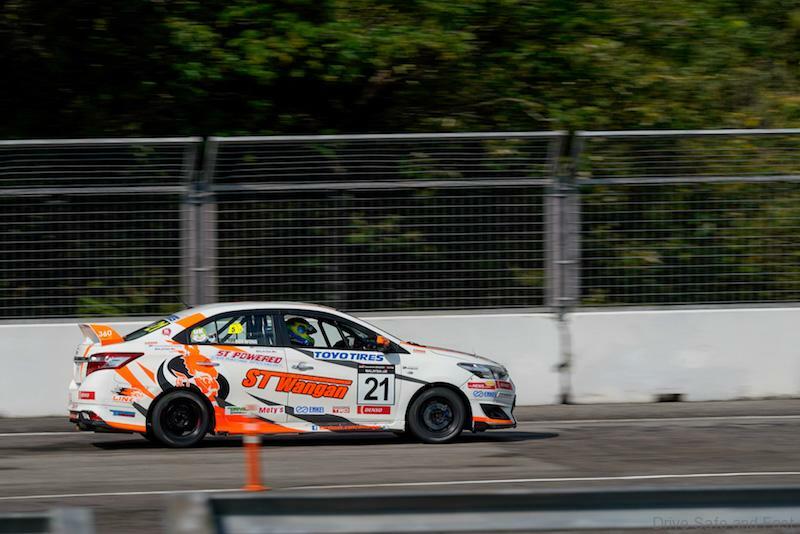 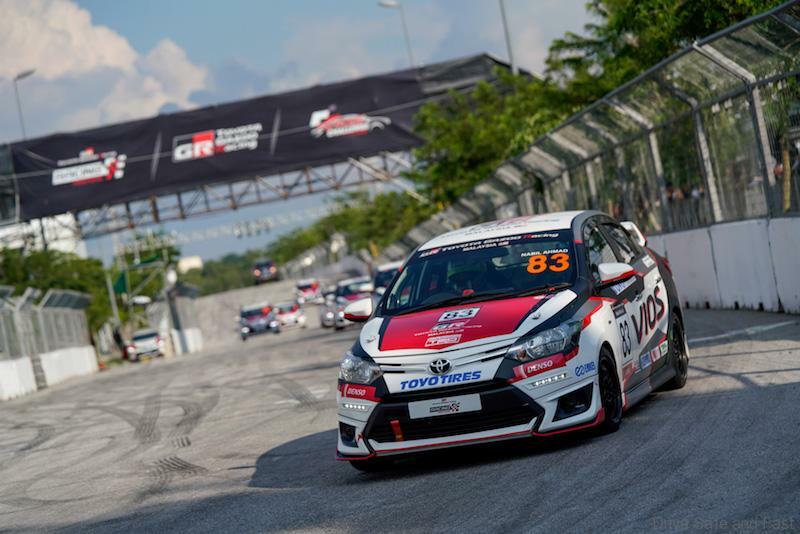 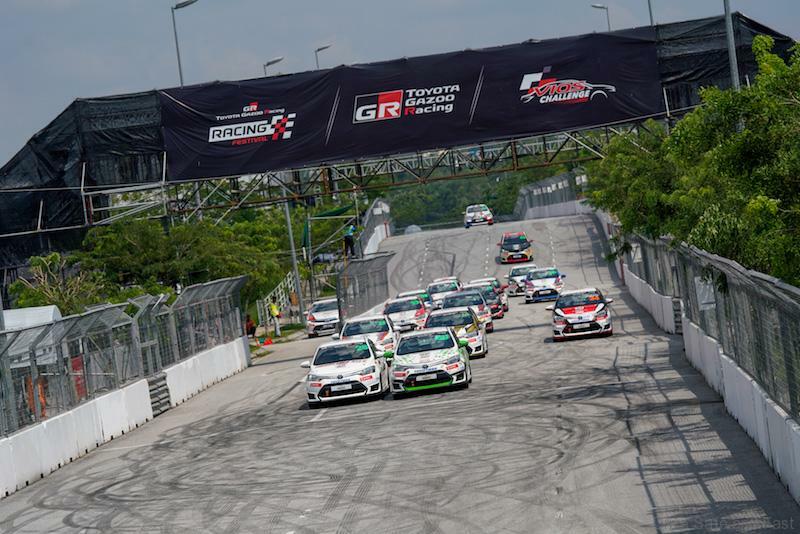 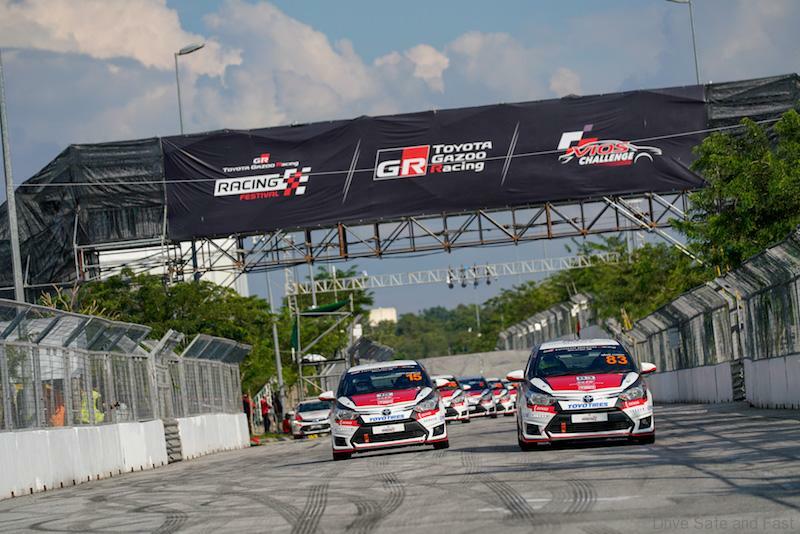 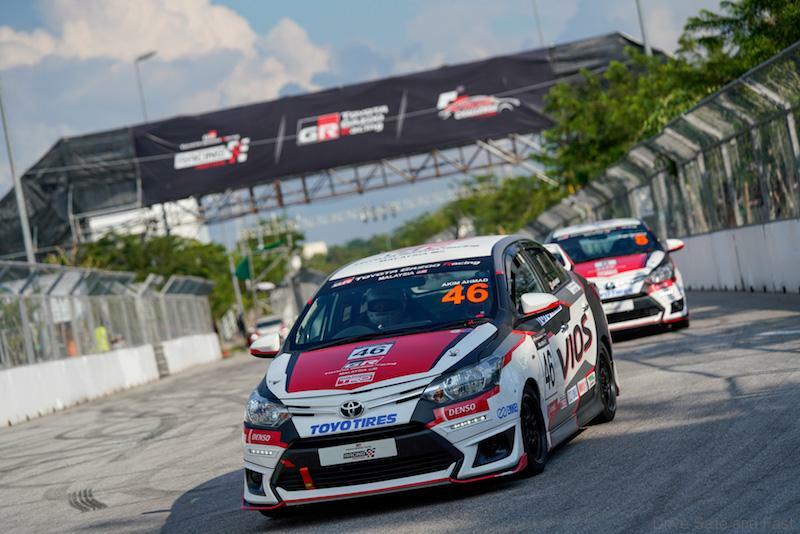 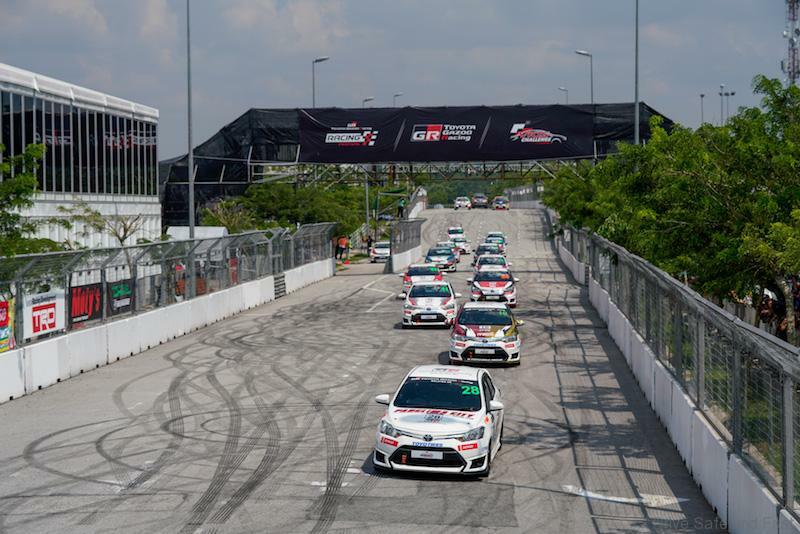 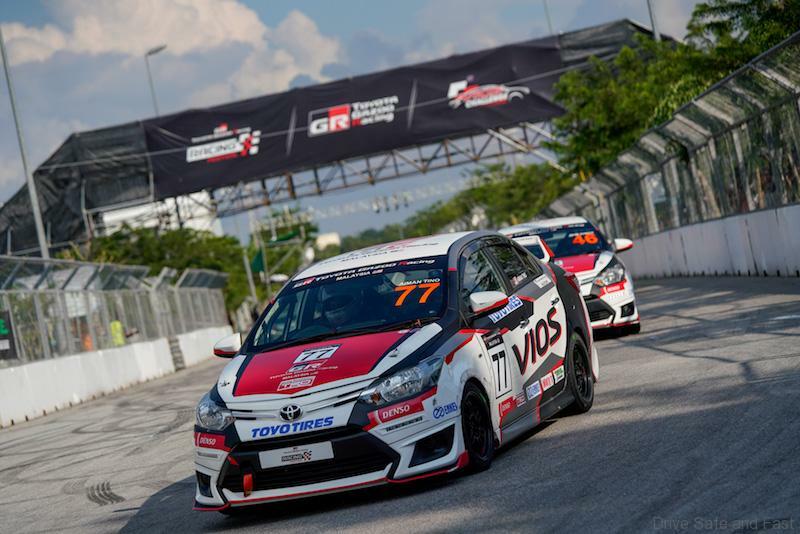 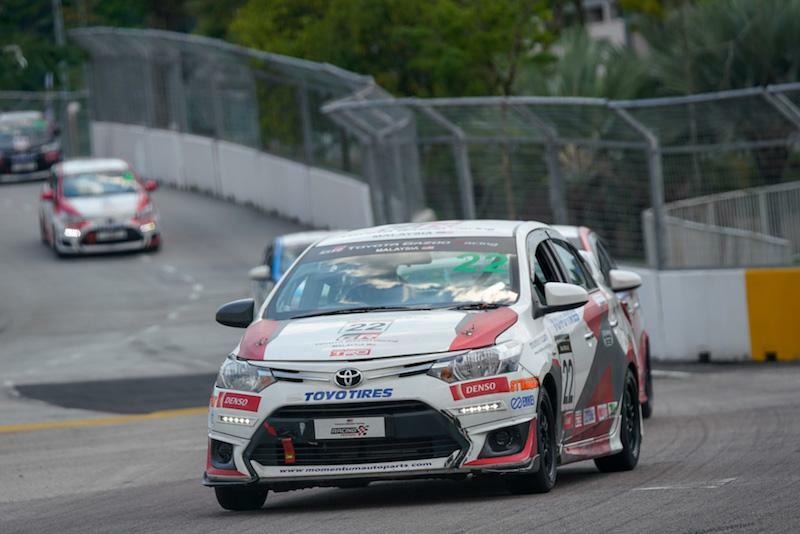 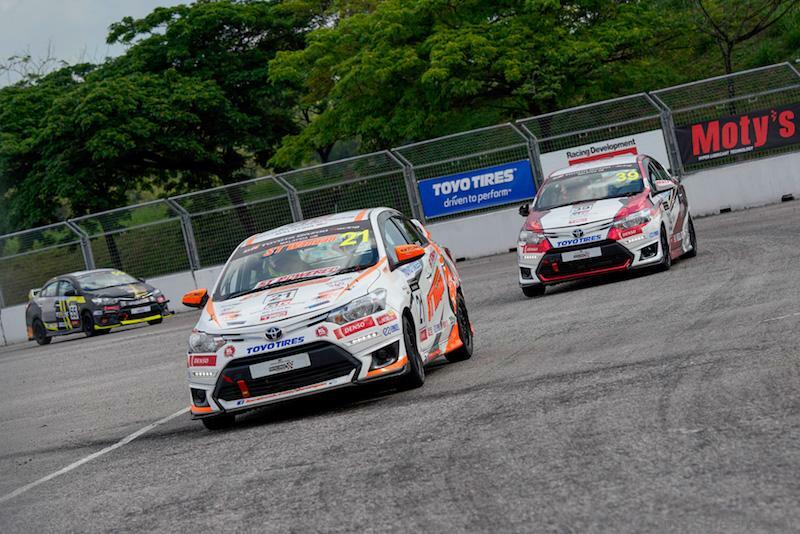 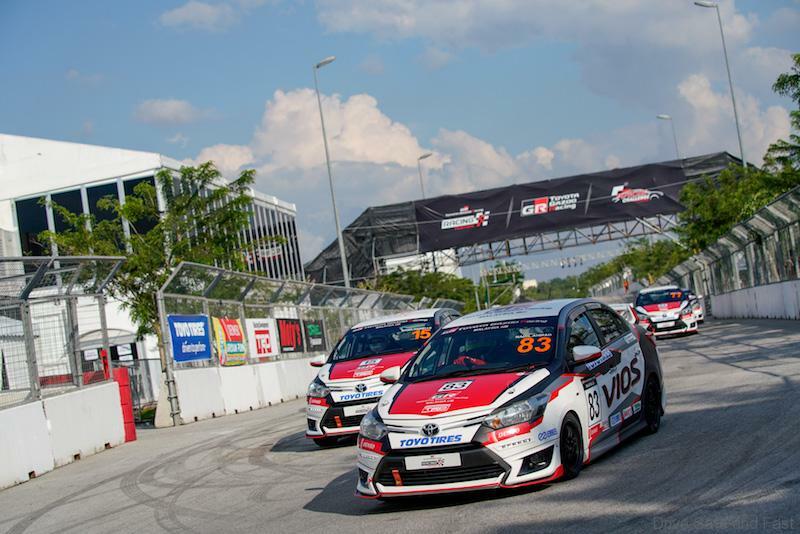 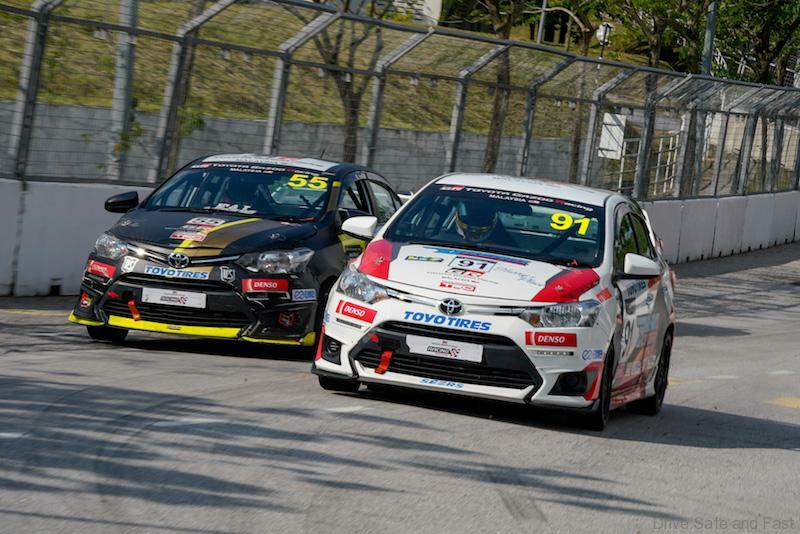 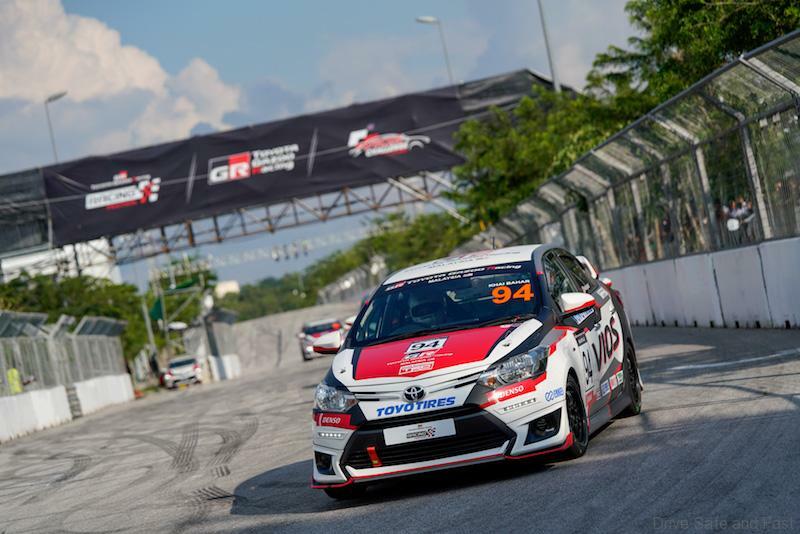 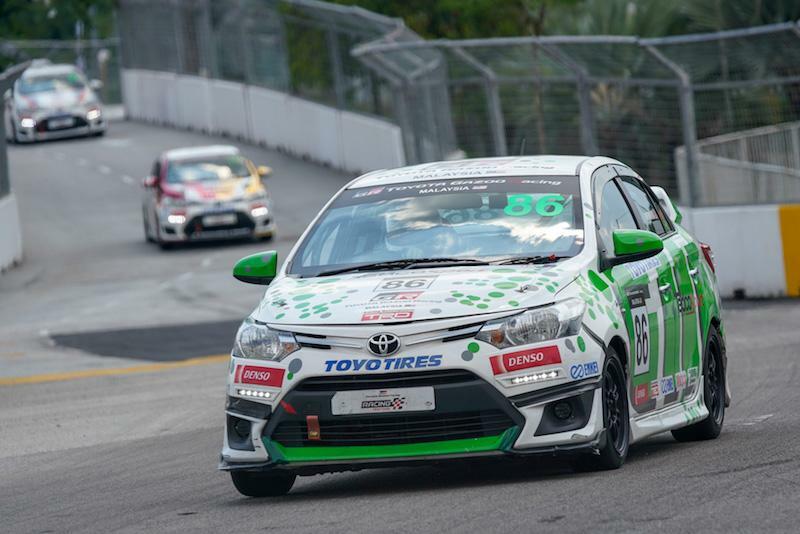 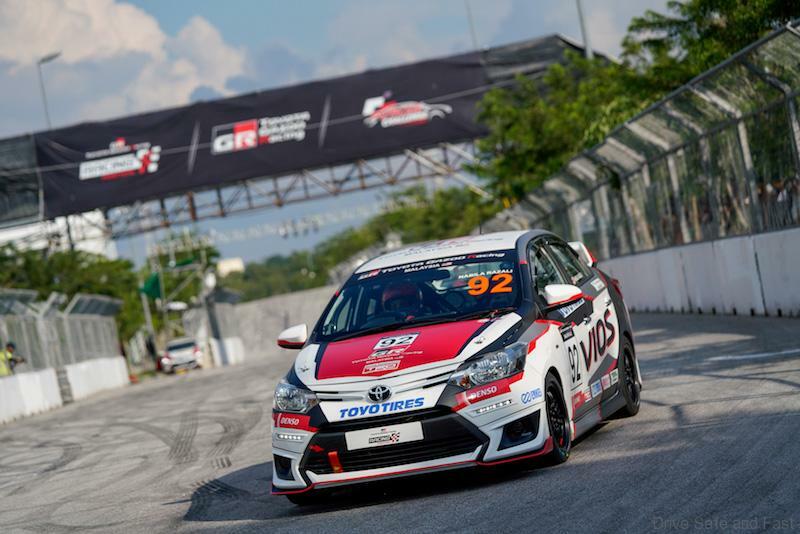 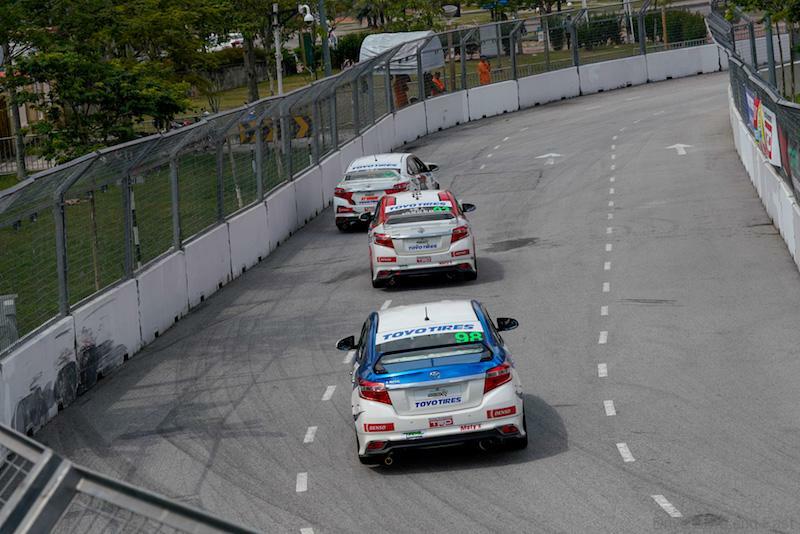 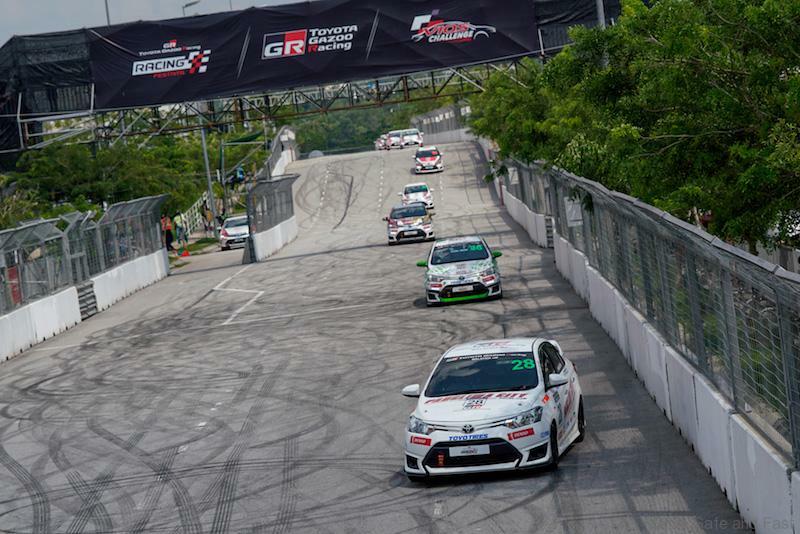 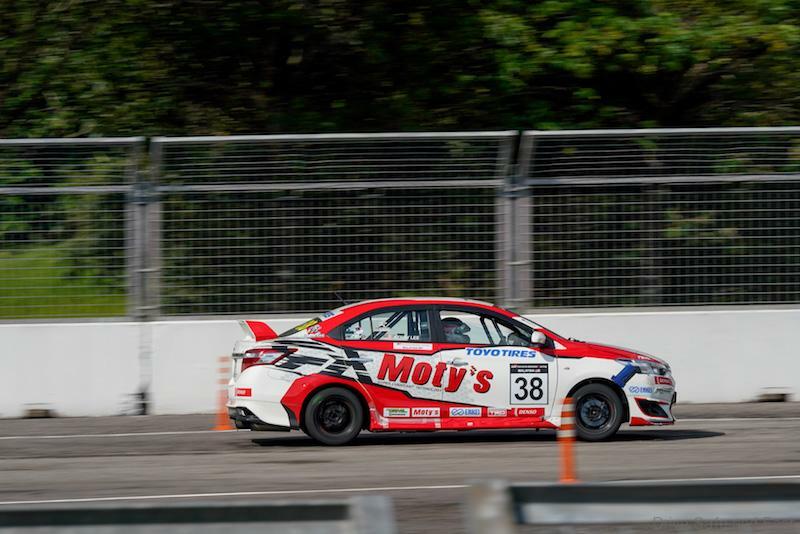 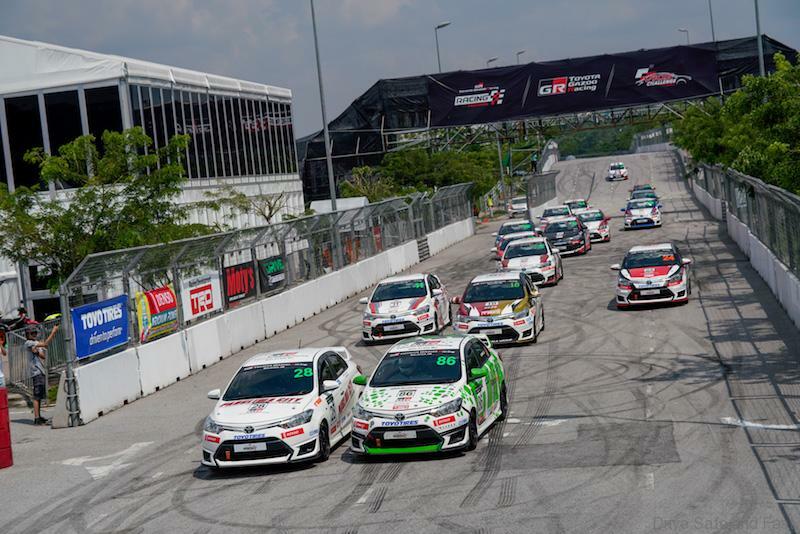 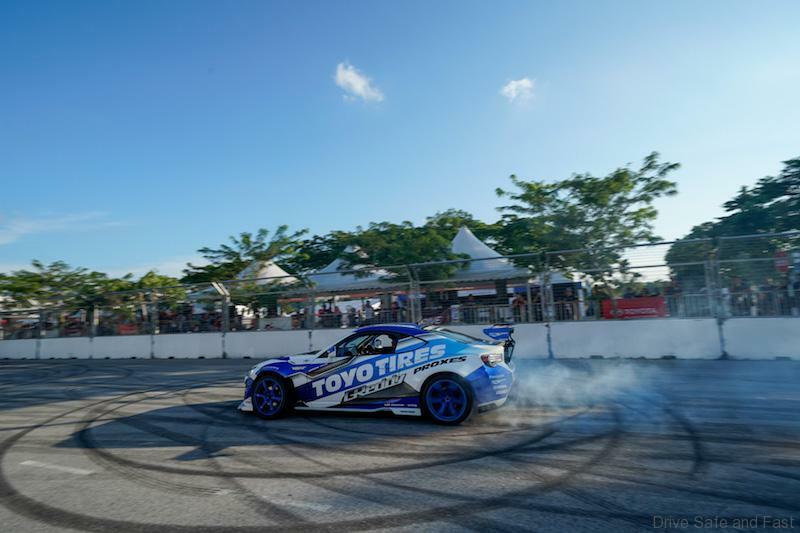 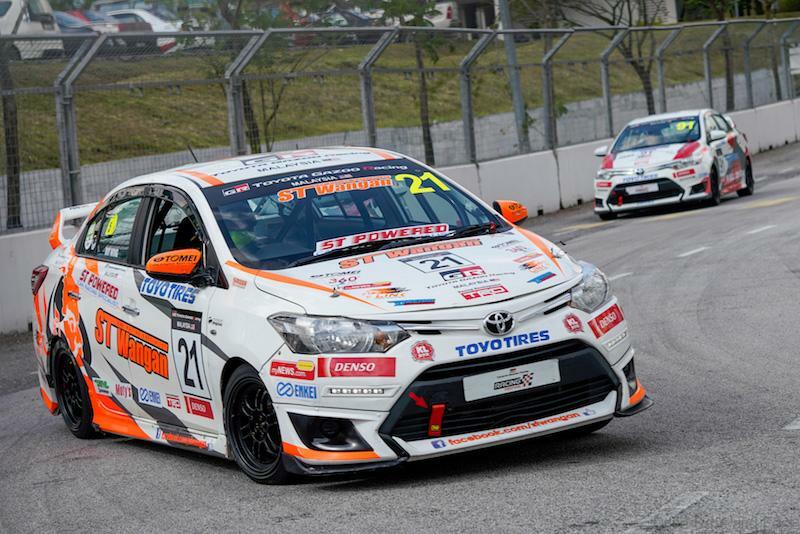 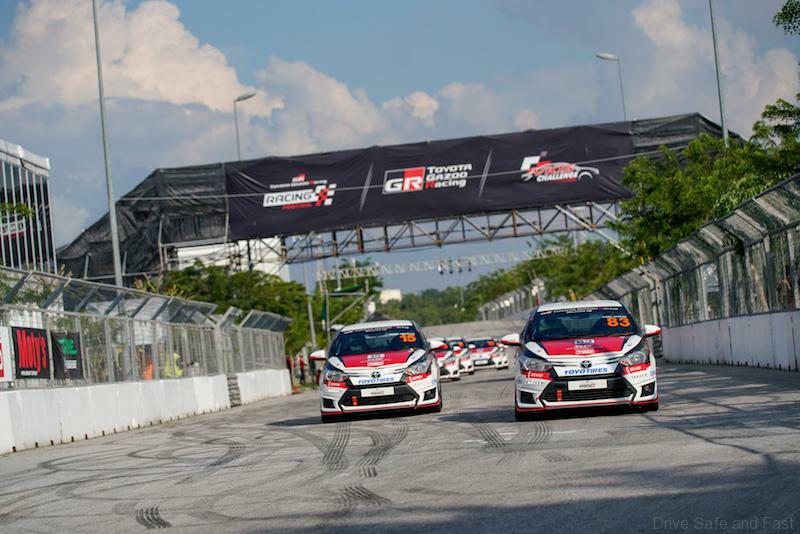 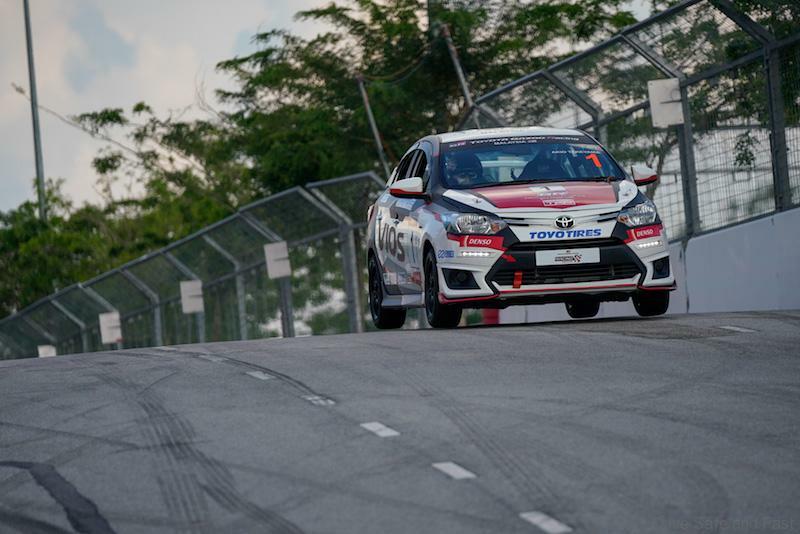 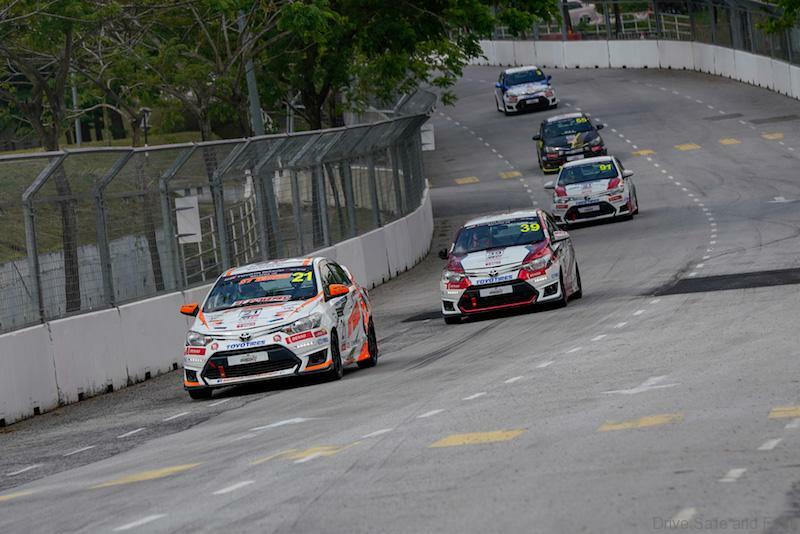 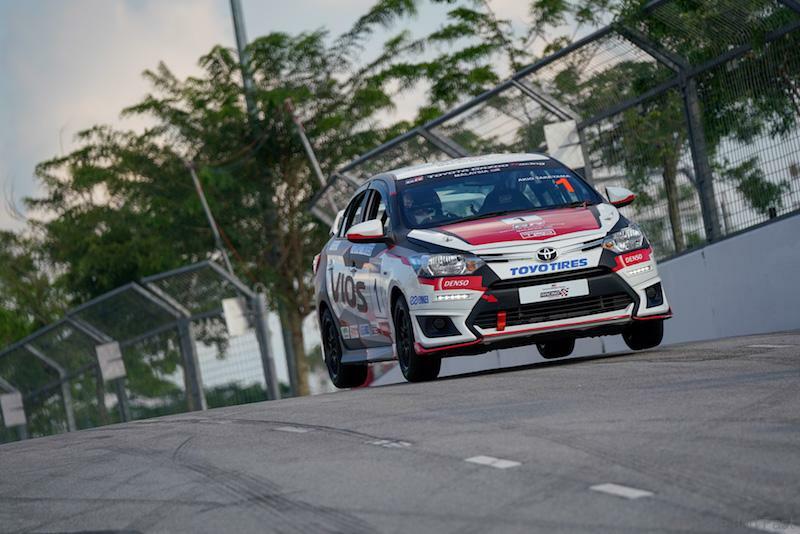 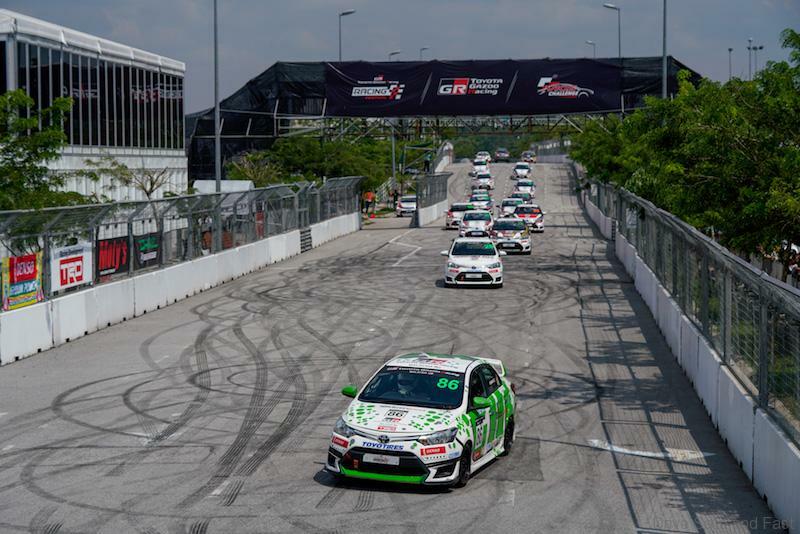 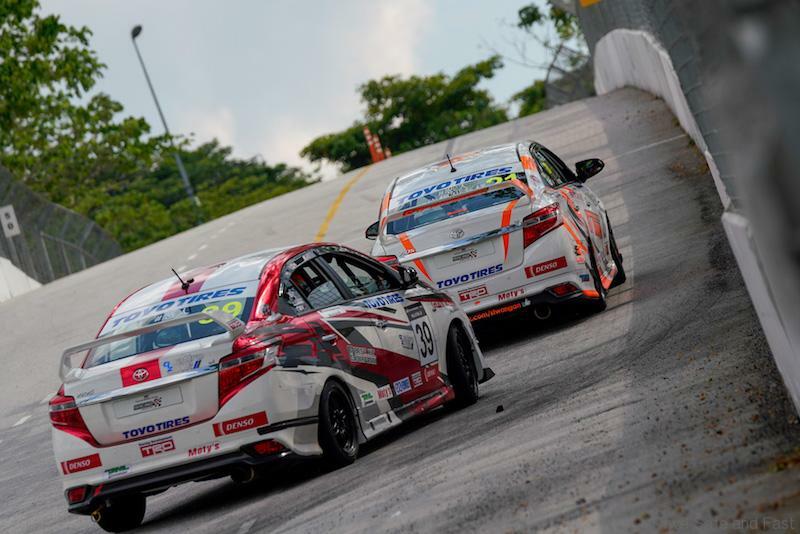 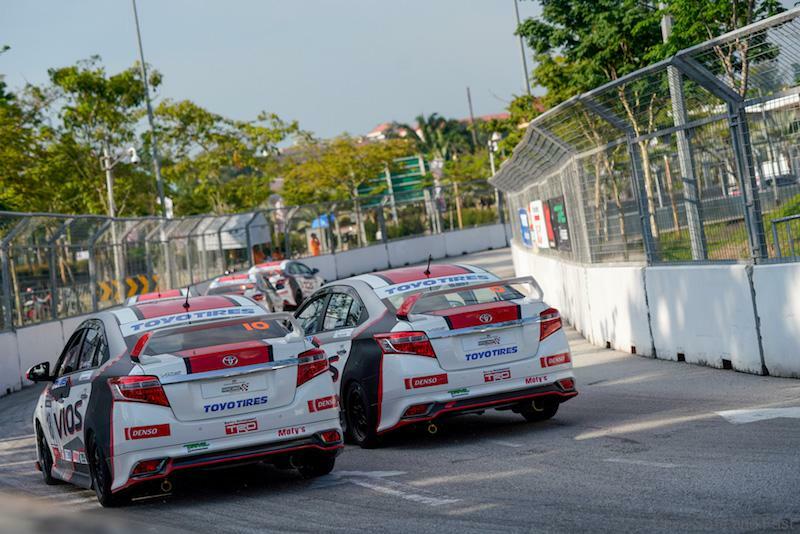 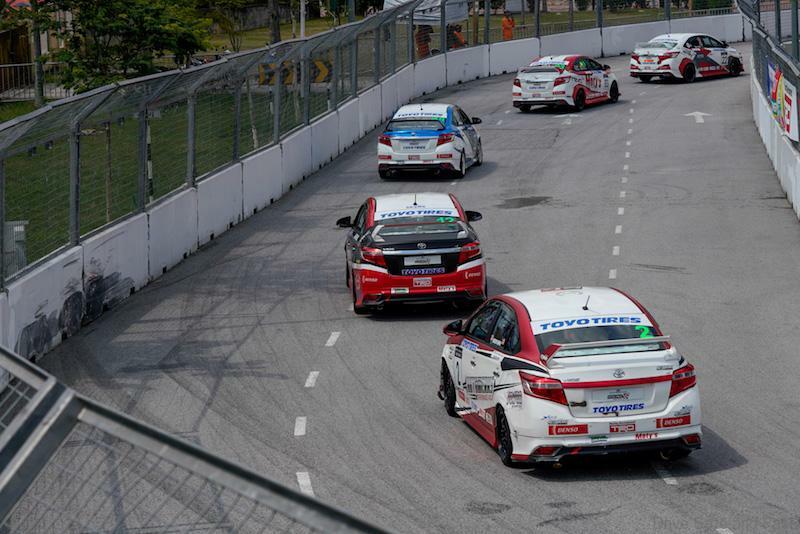 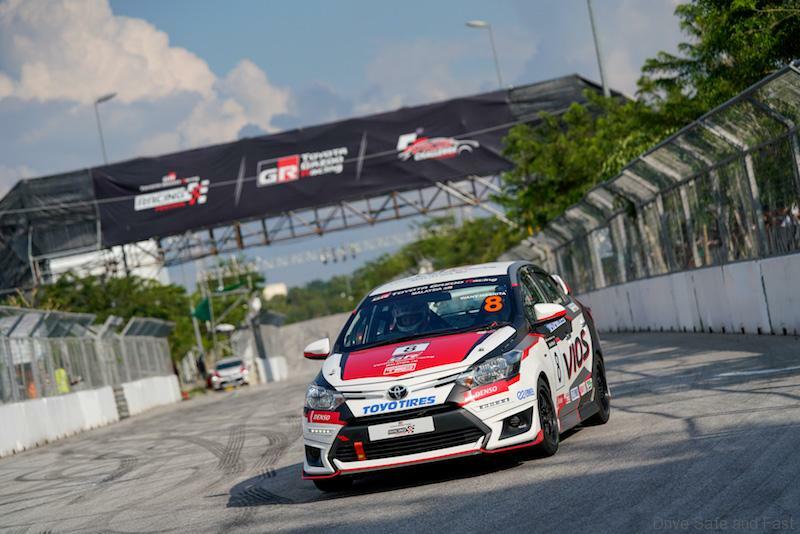 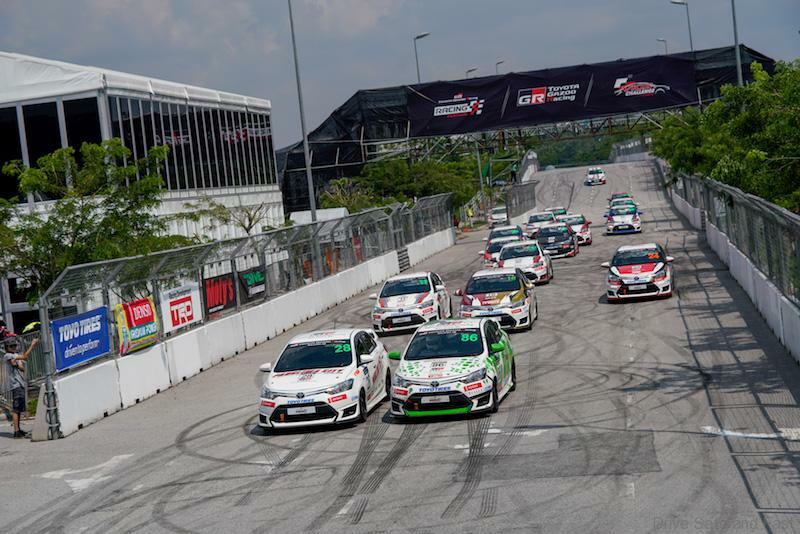 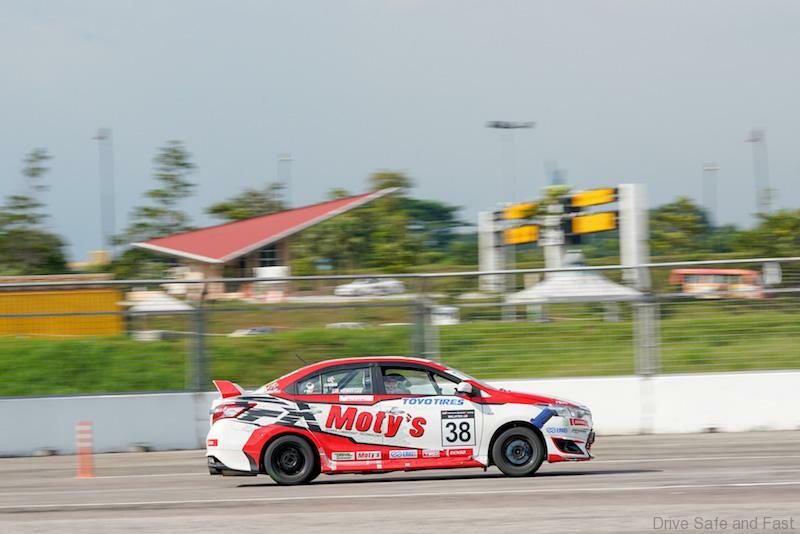 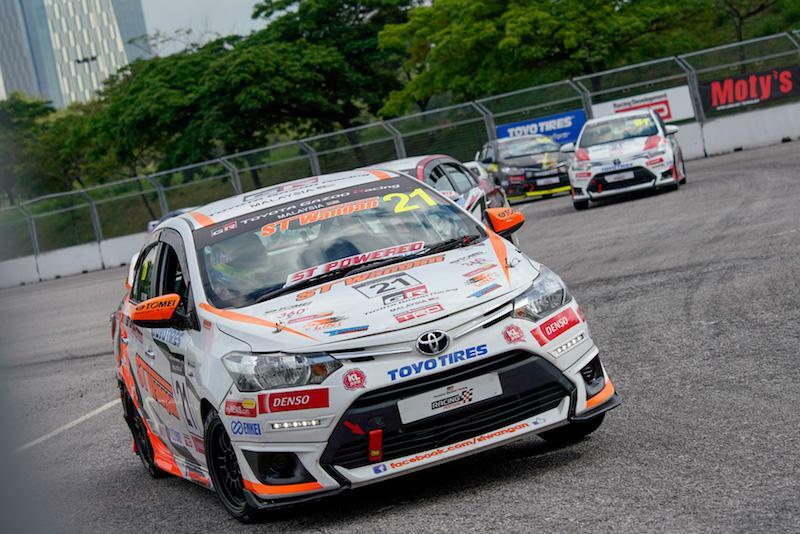 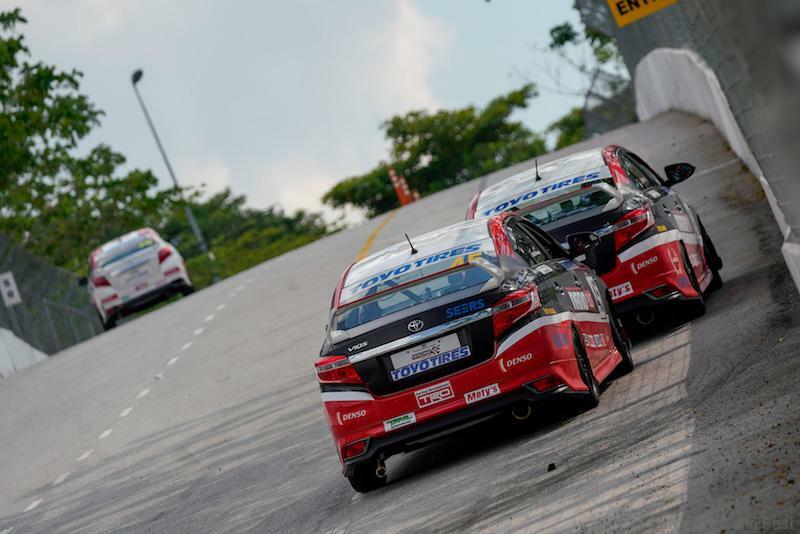 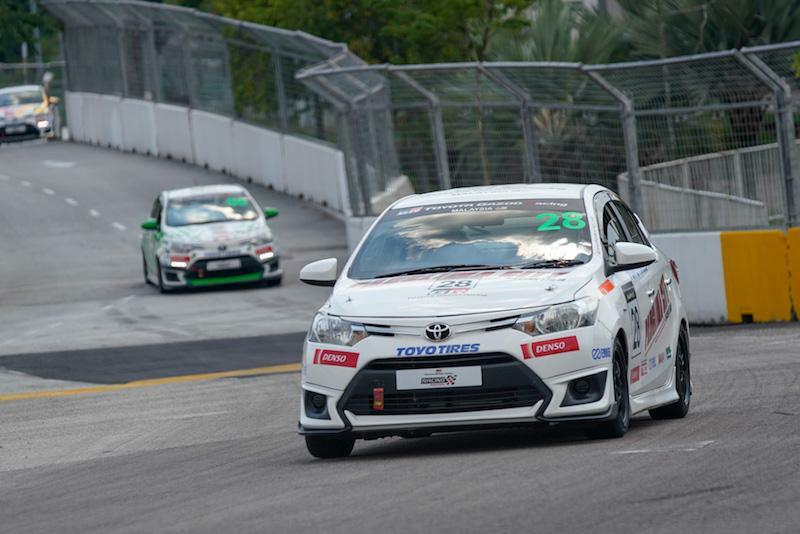 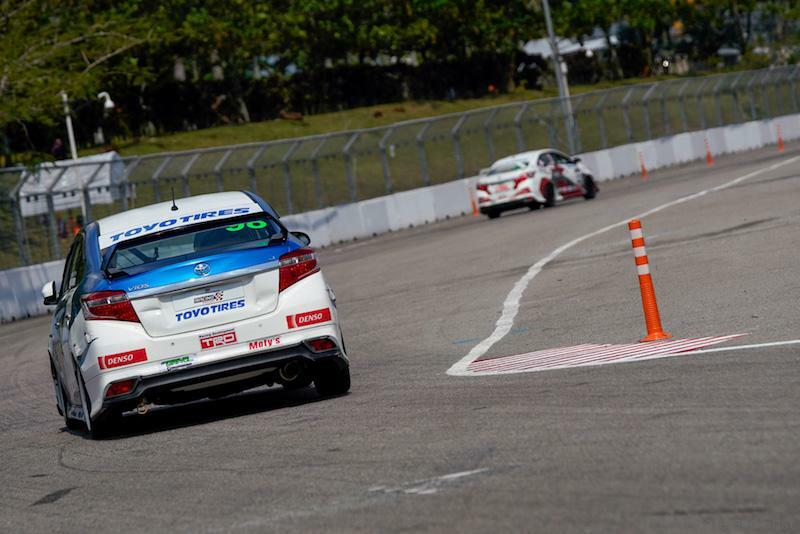 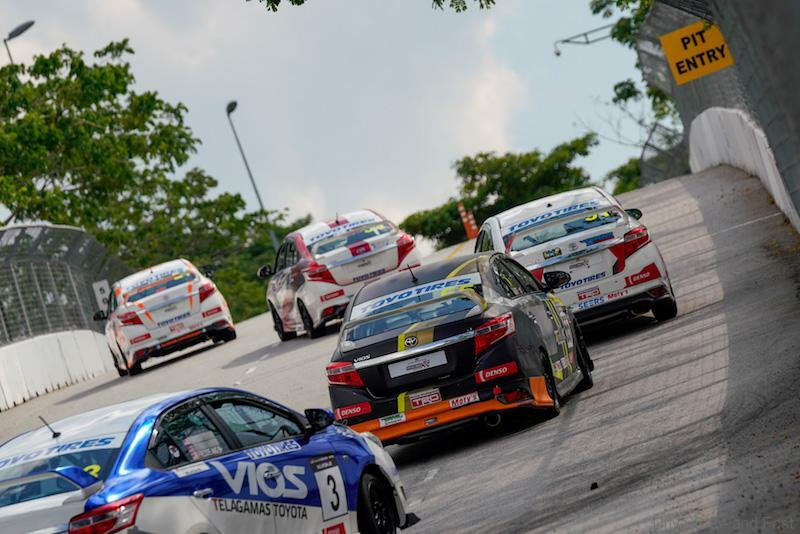 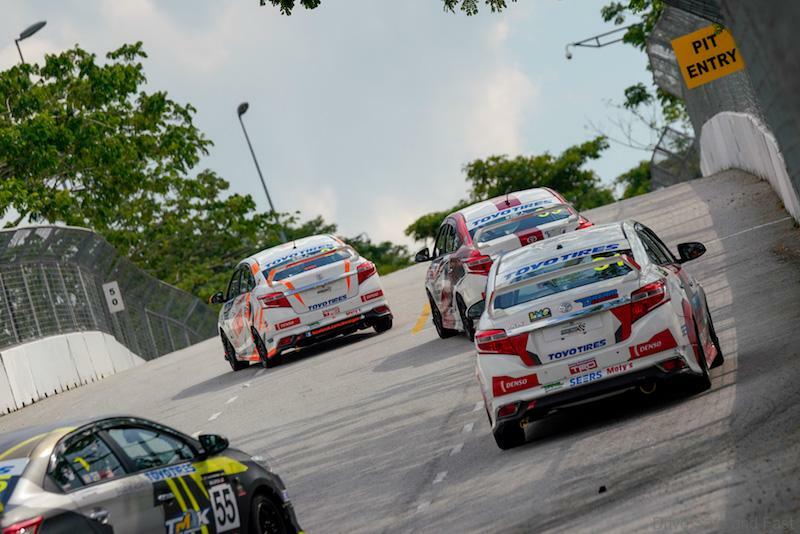 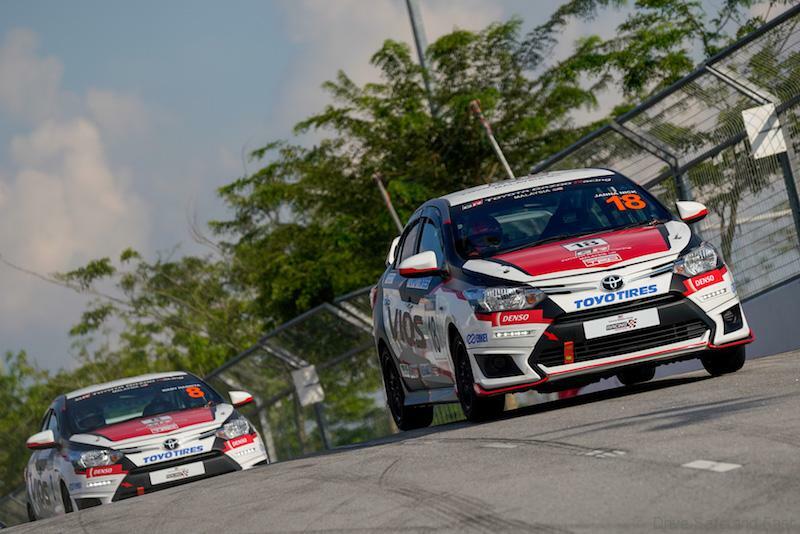 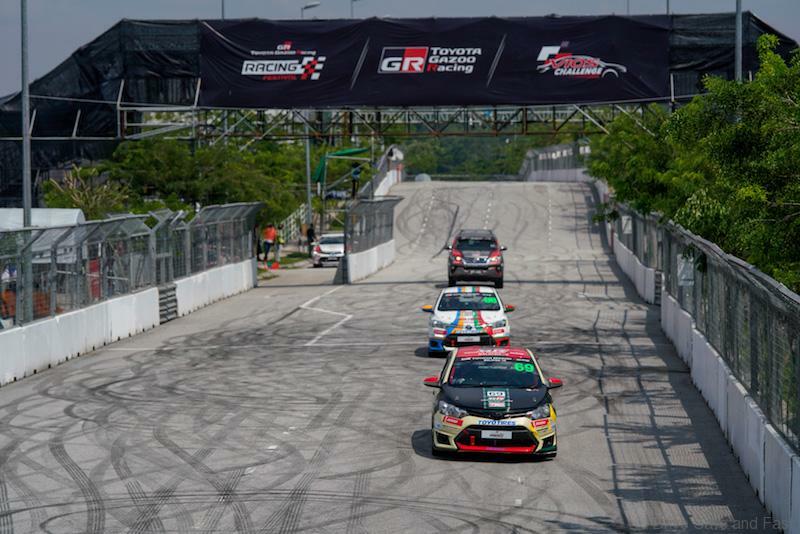 In the Sporting Class, Kenneth Koh too made a brilliant start from second place on the grid to win race 1 ahead of pole position man Brendon Lim and Dato’ Ken Foo who clinched third position. 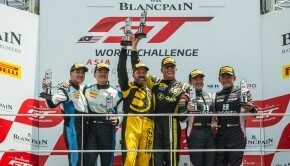 Koh took advantage of Lim’s poor start to lead the race from start to finish in what was essentially a “three-car train” to the finish and enroute to his first race win of the season. 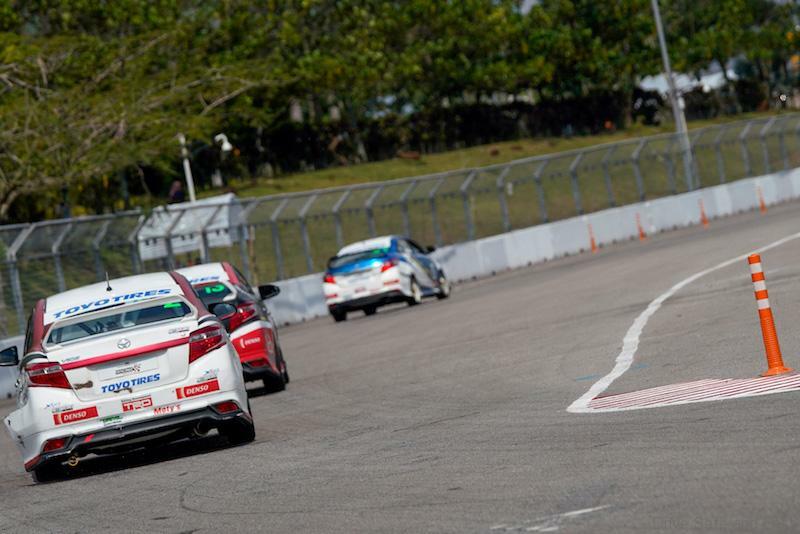 For Lim, forgetting to switch off the air-conditioning had cost him dearly. 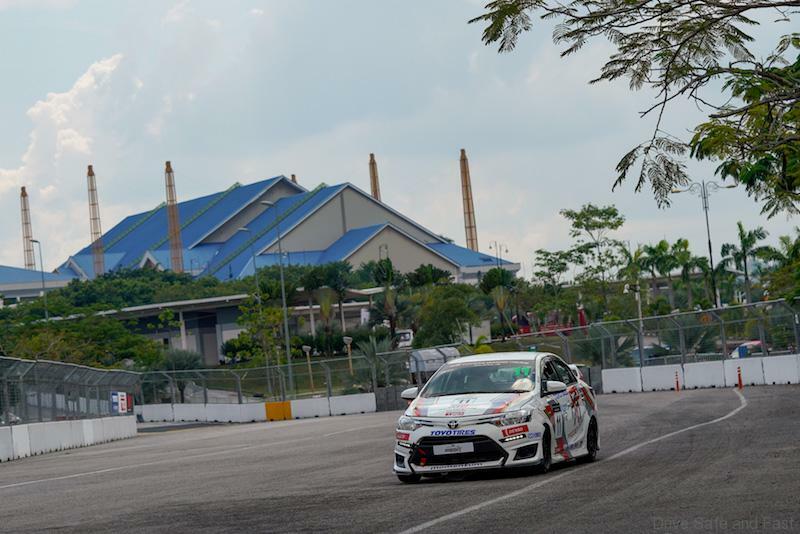 Foo who came in third, just a second behind, ran a generally trouble-free race despite having to recover from a nudge he received from behind on the second lap. 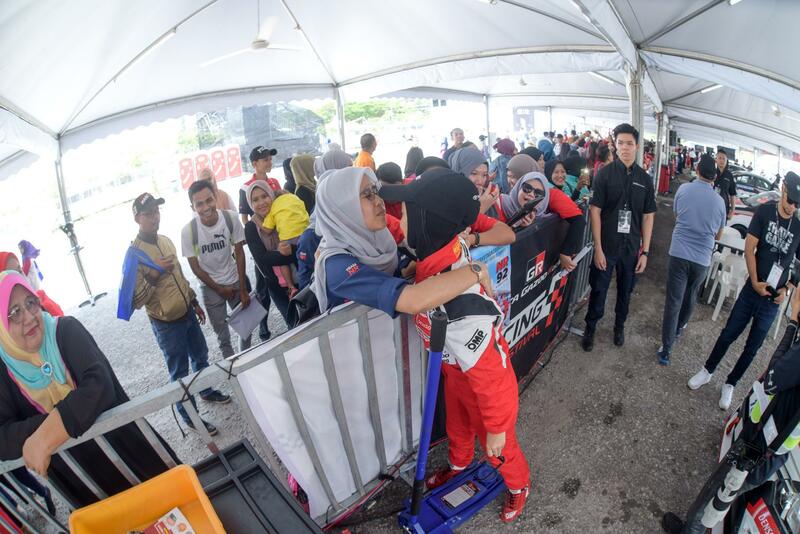 That nudge, came from 14-year-old Hayden Haikal who started from fourth place on the grid and had driven a remarkable race in hot pursuit of the top three drivers while at the same time, having to fend off celebrity Mohd Shukri Yahaya who was practically “glued” to the rear bumper of his Toyota Vios. 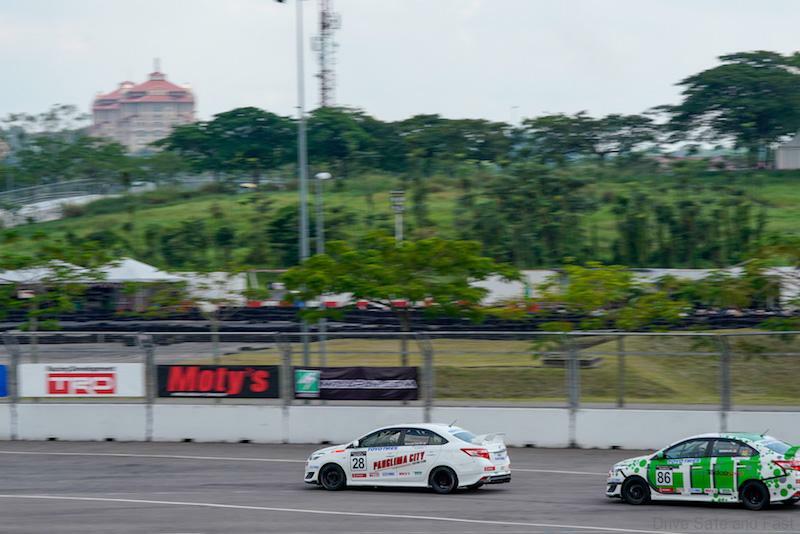 Mohd Shukri eventually succeeded in passing Hayden for fourth place one lap before the end of the race. 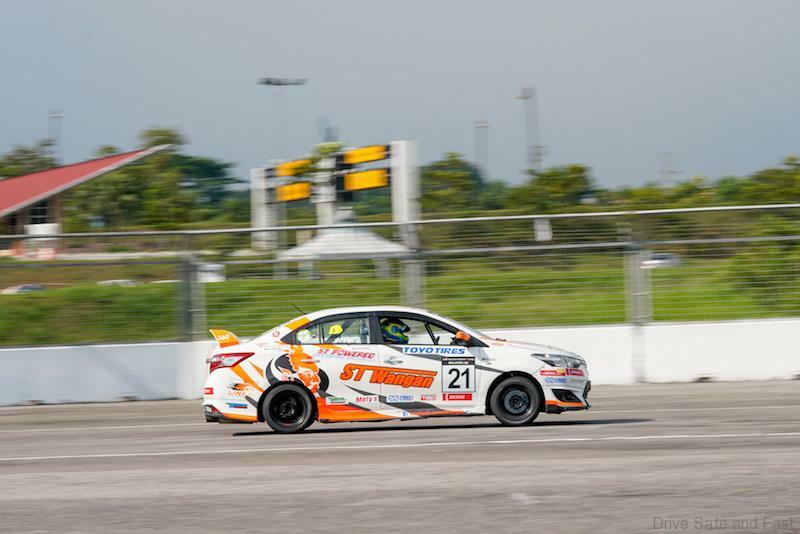 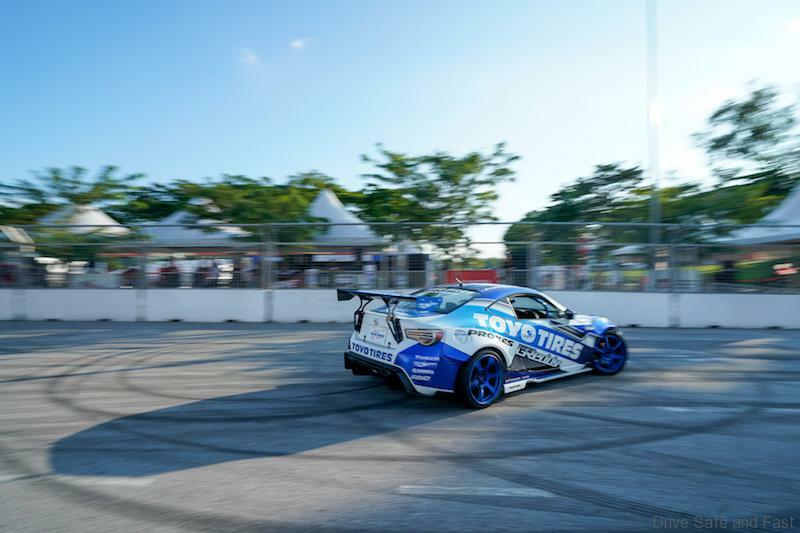 Pole position man Boy Wong kept his cool to drive a composed race from start to finish and fight off stiff competition from series leader William Ho in the Super Sporting class, completing his race with a time of 26 minutes:14.296 seconds. 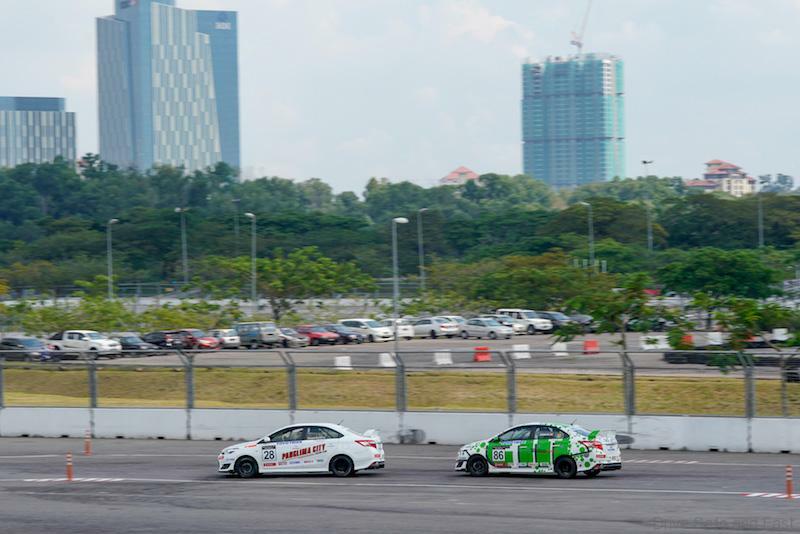 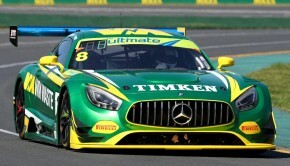 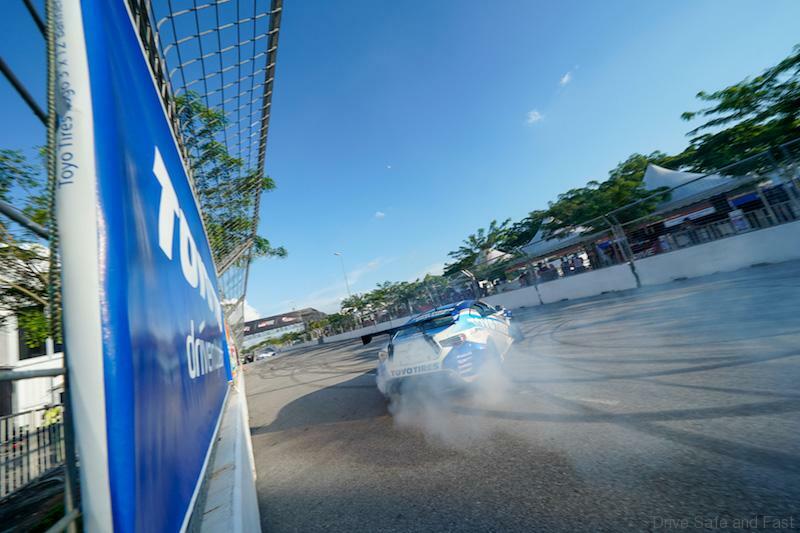 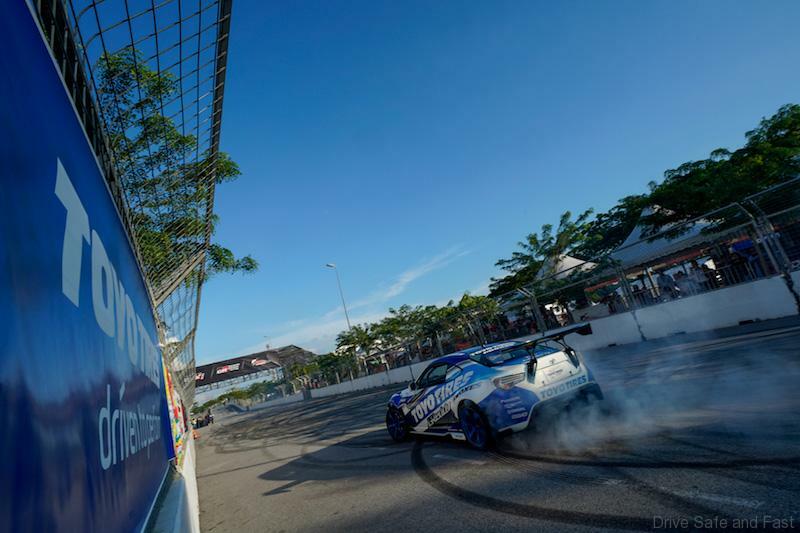 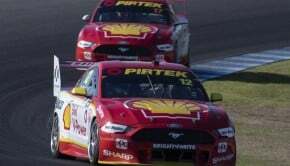 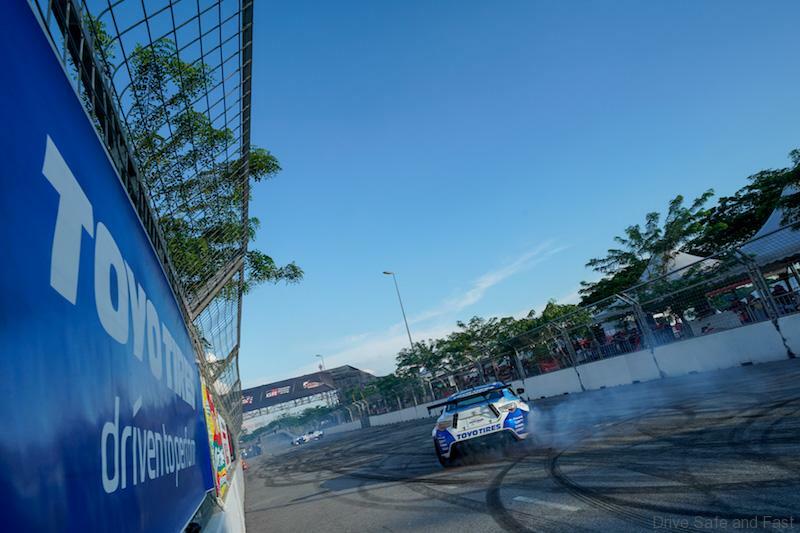 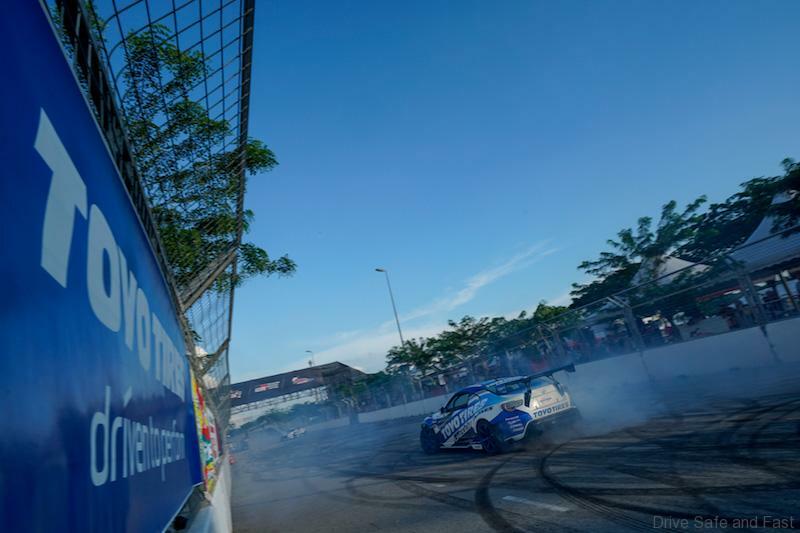 The gap was just over half a second when both drivers crossed the finish line, with Brendan Paul Anthony claiming third position a further six seconds adrift. 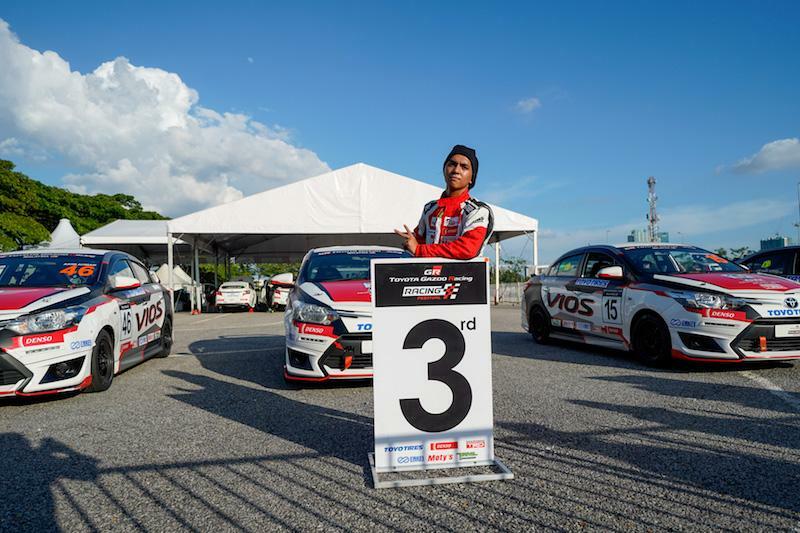 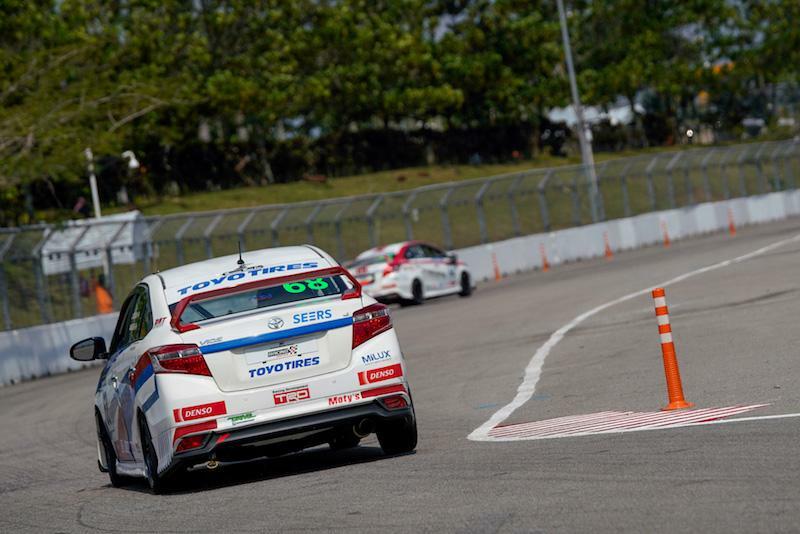 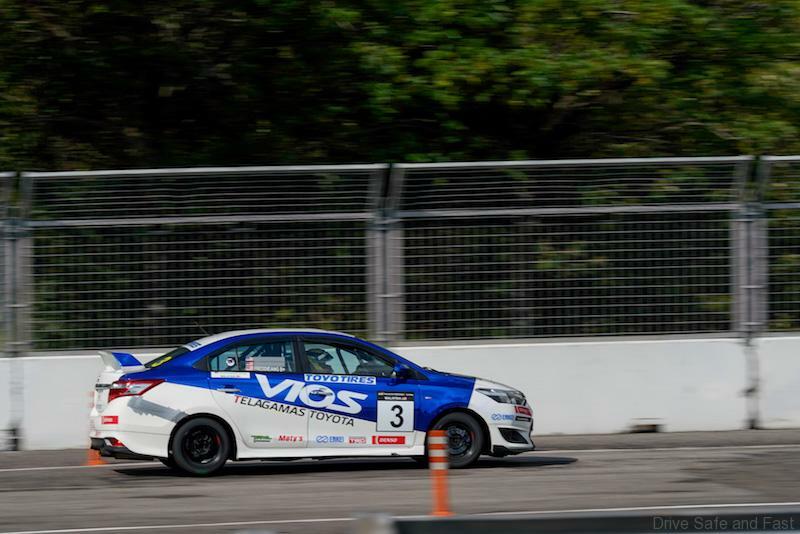 For second place winner Ho who has since scored three podium finishes in three races (he finished first and second in Kuala Terengganu in August), conceding victory for valuable points consolidates his position in the overall point standings. 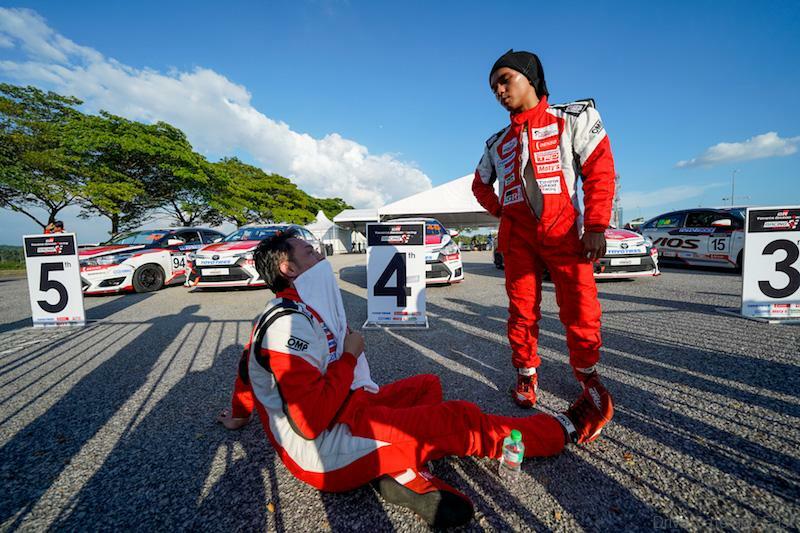 Brendon Paul meanwhile, is happy with third place although he could not make the most of starting from the front row of the grid in second position. 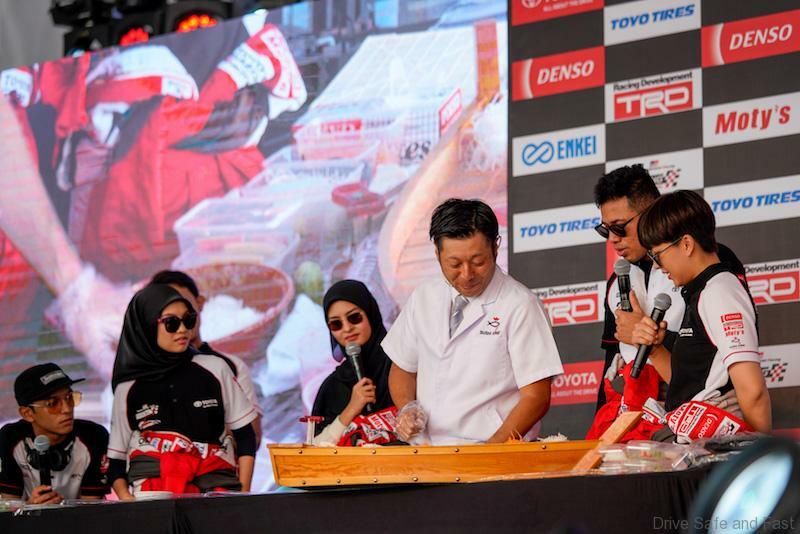 The two-day Toyota Gazoo Racing Festival showcases a multitude of activities from the preview and public test drive of the all-new Toyota Rush, a 1.5-litre compact sports utility vehicle (SUV), test drives of existing model line-up, promotions and celebrity performances to thrilling race action on a purpose-built 1.99km street circuit by racers competing in the Promotional, Sporting and Super Sporting classes respectively.